It would take another eight years for the fourth person to complete the climbs. The hundredth person to do so finished in 1955, but more and more hikers join the ranks every year. Last year 735 hikers became 46ers and there will probably be another 800 this year. Much has changed over the last one hundred years at Whiteface Mountain Now you can drive to the top, and hundreds of people do so on nice weekend days. There is a cafe and gift shop just below the summit and a weather station on top of the mountain overlooking the ski resort carved into the forest below it. There are bike and snowmobile trails at the base of the mountain and observation decks with binoculars at the top. In the summer of 2014, I decided to climb the Forty-Six. 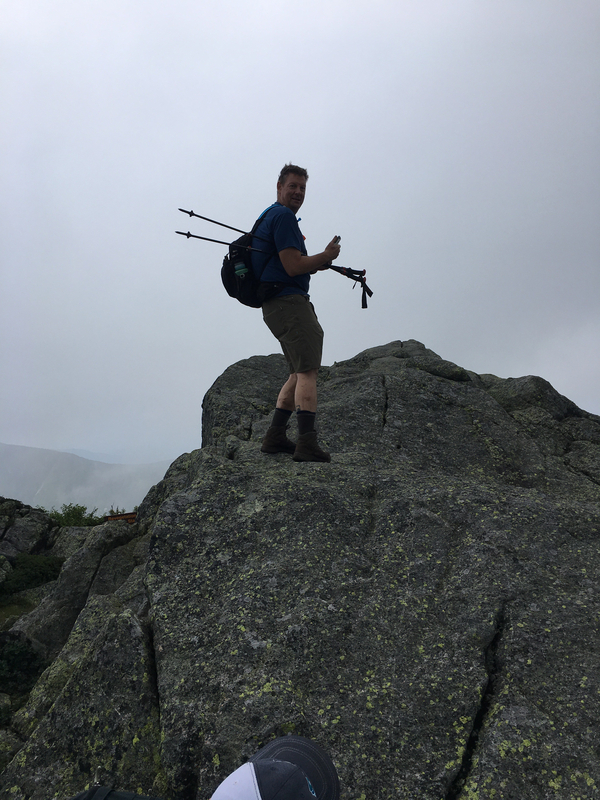 I started with Porter and Cascade and my plan was to save Whiteface Mountain for last and to finish on August 1, 2018, one hundred years after the first climb by the first of the Forty-Sixers. When that anniversary came I was in Baltimore sitting next to Kathy as she started a new round of chemotherapy. When you fight cancer you do what can be done. And when someone you love has cancer you do not let her fight it alone. 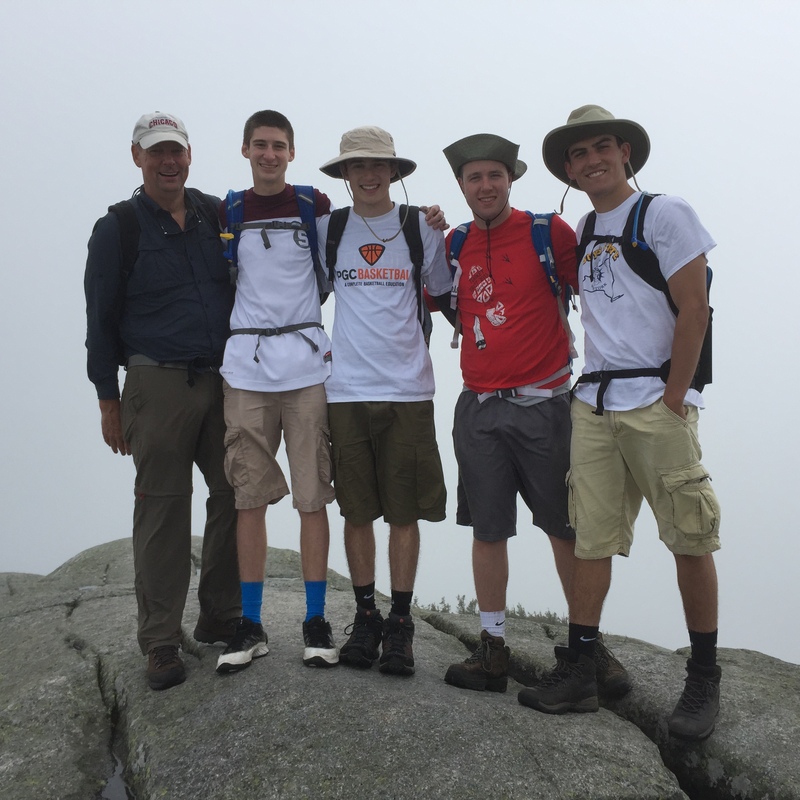 Which is why on August 25, 2018, brothers Matt and Alex Hoskins, along with me their guide, climbed Whiteface Mountain. And Kathy met us at the top. 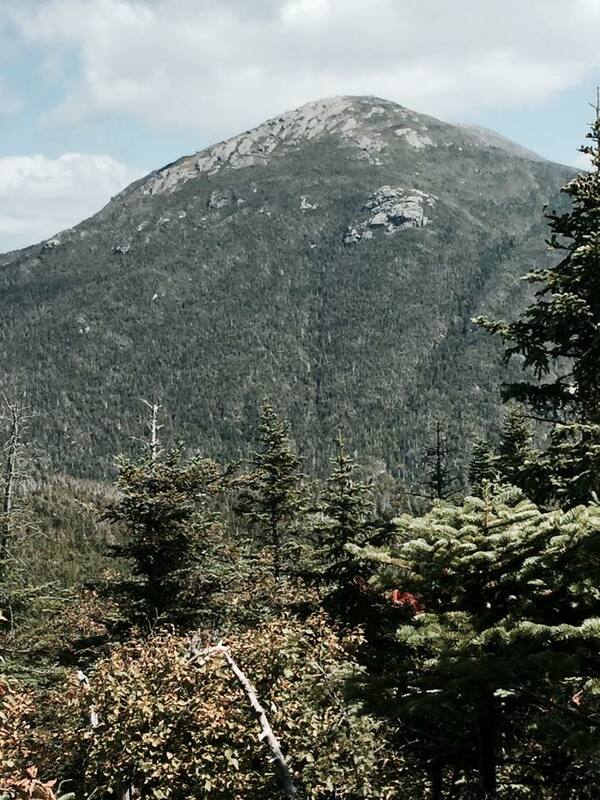 Today I hiked to Rocky Peak Ridge and completed my thirty-ninth summit towards becoming an Adirondack Forty-sixer. 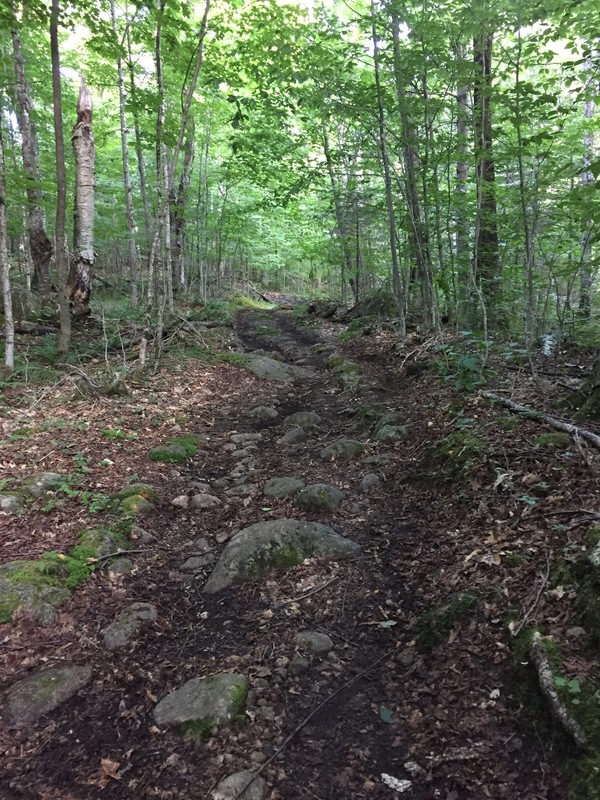 I approached from the Roaring Brook trail that leads to Giant Mountain and then hiked out and back to Rocky Peak and descended the same way I had hiked in. I saved a little time by skipping the short detour to the summit of Giant because I had already been there twice before. 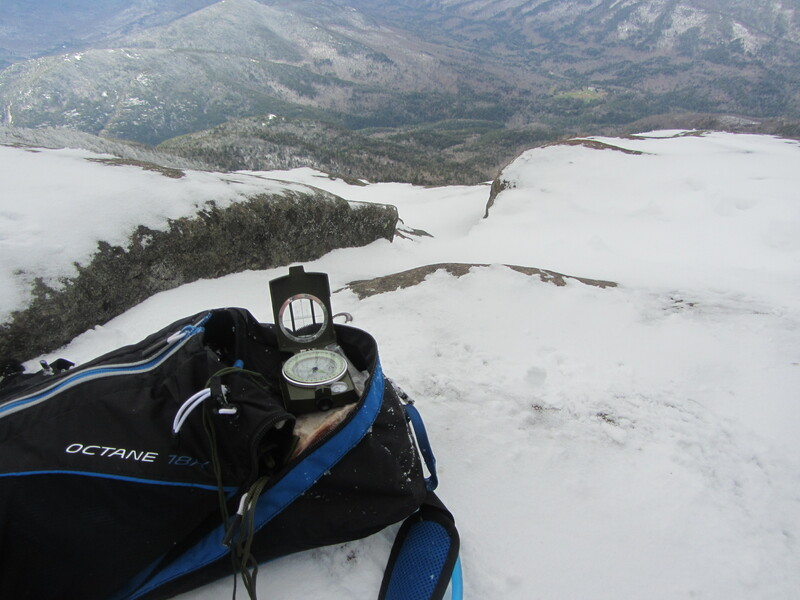 The first time was on a cold November day in 2014, when I wore micro spikes and a heavy sweater and found the summit covered with a dusting of snow. The second time was on the backpacking trip I took in September, 2015. As I merged onto the Ridge Trail I came upon a spot I remembered from that trip. I was hiking that day with our leader, Hannah, my tent mate Adam and Paula, who was struggling, having just recovered from knee surgery. We started the day on the back side of Giant and our plan was to camp at the opposite base of the mountain at a pond called Giant’s Washbowl. Paula struggled during the climb, but I was able to help her by supporting the weight of her pack as she scrambled up the rocks to the summit. The climb down was much more difficult for her and, exhausted with a throbbing knee, Paula sank to the ground and started to cry. We all took off our packs, offered words of encouragement, and waited for our friend’s emotions and fears to run their course. After a while, Hannah reached into her backpack and produced a chocolate bar. It had been a gift to her from someone she cared a great deal for but who lived too many states away from where she made her home. The wrapper had a message printed on the inside and after she divided the chocolate amongst us, I asked to see the wrapper. The message printed there was a love poem and I read it aloud in my best impression of a Shakespearean actor. Adam and Paula laughed at my performance and with that we decided to push on to the campsite. Hannah was very quiet as I read the poem. I handed the wrapper back to her and turned away to struggle into my back pack. As I regained my balance and adjusted the straps I caught a glimpse of her fold the poem and gently place it in her shirt pocket. Just a couple hundred yards more. I started swimming with a Masters swim team in the summer before I turned 50. Some parents at the swim club where we belonged hired a coach who held three morning practices a week. After that summer I followed the coach to the indoor team she was coaching and I have been swimming year round ever since. Together my teammates and I have swum up the Hudson River and across the Chesapeake Bay and the mouth of the Potomac and have trained together for Iron Man triathlons and marathons. This weekend I hosted five of my teammates in Lake Placid where we competed in the annual race along the submerged cable that marks the Iron Man course. They each did fantastic, winning their respective age groups and being awarded the loaf of bread that is traditionally given as the award for first place. 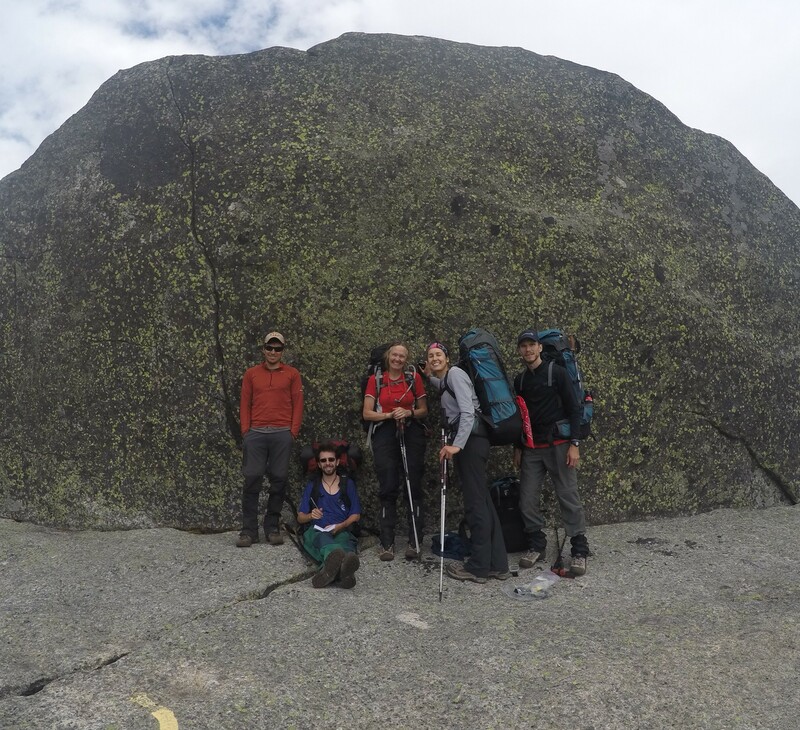 The next day, they agreed to join me on a hike to Mount Colvin and Blake Peak, to bring my total to 38 high peaks summited of the 46 that I am trying to climb by next August 1st. The day was perfect and we were greeted with a rainbow as we started the hike. The trails were still muddy from the recent rain but the views at Colvin were spectacular and we watched Marcy emerge as the morning clouds lifted away. The hike out and back to Blake was hard because there were several rock faces that needed to be scrambled and our boots and shoes were slippery from the mud. 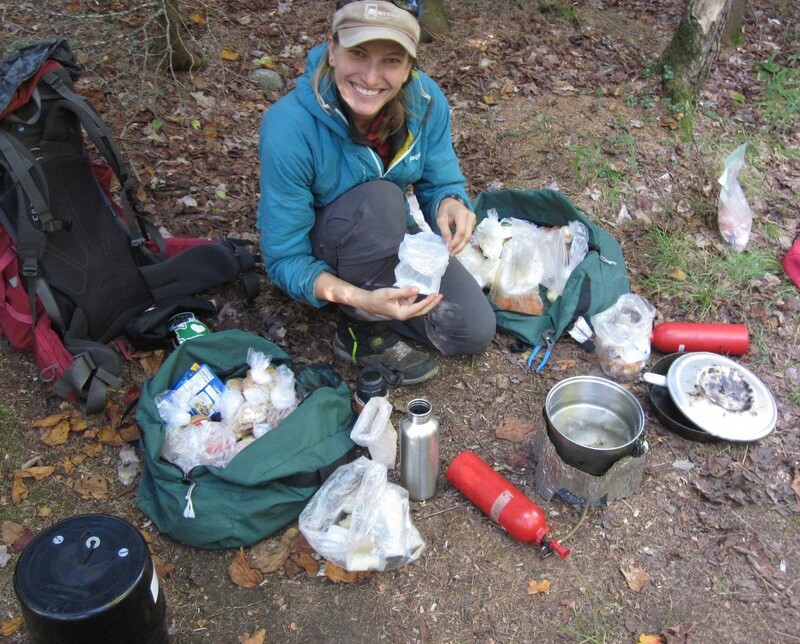 We were pretty tired when we returned to Colvin to finish the food we had brought with us and to even out the water we were carrying. I suggested that we detour on our way down to visit the Fish Hawk and Indian Head cliffs that overlook the Lower Ausable Lake. When asked how much further it would add to the trip I replied, “just a couple hundred yards more.” The side trip to the cliffs was closer to a mile and included a steep climb that was made even harder by the fact that when we reached it we were already exhausted from ten hours of hiking. My companions took it in stride and we rested while enjoying the spectacular view of the lake and valley from atop the cliffs before hiking down to Lake Road and back to the car. Later, while eating pizza for dinner, the conversation turned to my estimation skills. While I had been nearly exact on all of my mileage and time estimates throughout the day, I had missed the estimate to the cliffs by nearly a mile. They joked about it and I am sure I will be teased about this miscalculation for years to come. It has been nearly seven years since I started swimming and over this time coaches and teammates have come and gone. They have moved on to new jobs and new cities and have been replaced by the new friends with whom I train today. 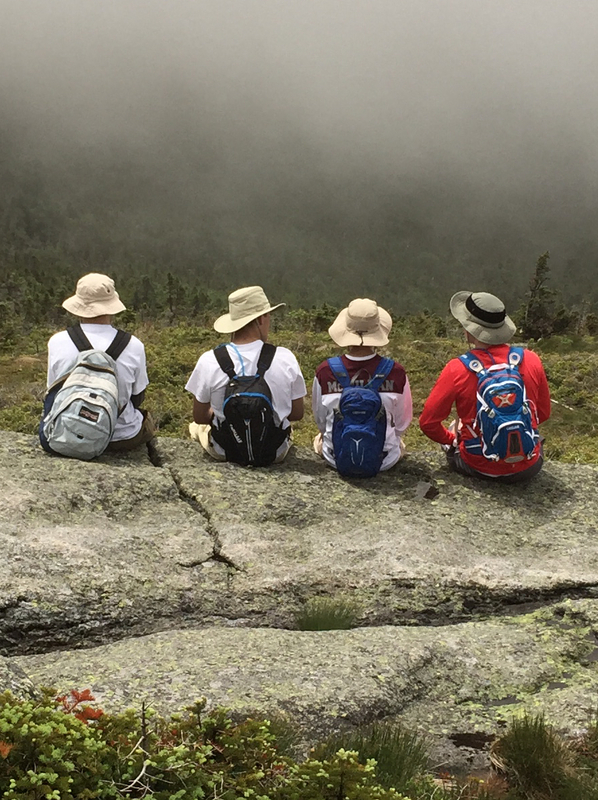 Eventually, the friends I hiked with yesterday will also move away as they build their own families and careers. And like the swimmers who came before them, I will miss them and remind them as they leave that in life, just as in hiking, something great always awaits us down the trail, just a couple hundred yards more. Twice before I thought I would climb Mount Skylight. The first time was when I hiked over Marcy to climb Gray and take a swim in Lake Tear of the Clouds. I decided to bypass Skylight that day because my plan was to climb back over Marcy and return to the trailhead the way I had come. I was tired and afraid that the one mile round trip to Skylight would take too long and too much energy. 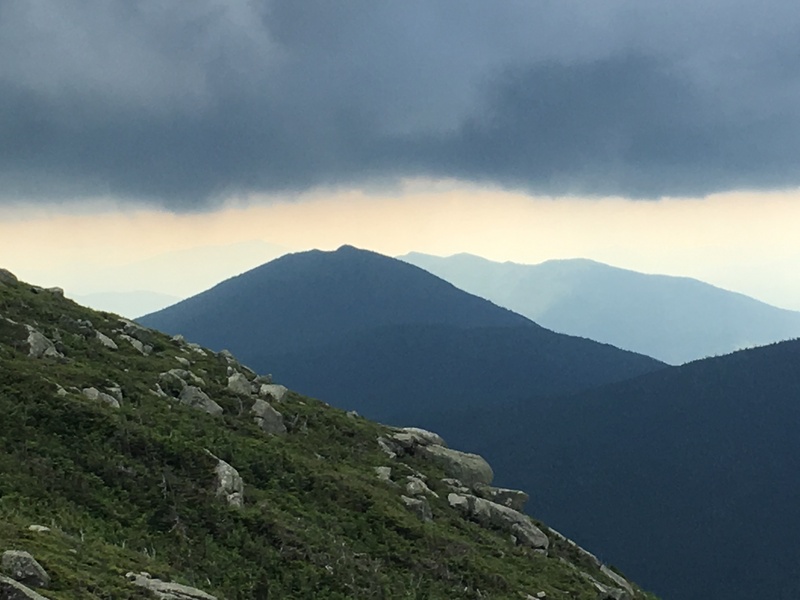 I hiked over Marcy again last summer, but heard thunder in the distance when I reached the trail to Skylight and, again, decided to leave that hike for another day. Yesterday I finally made it to the summit. 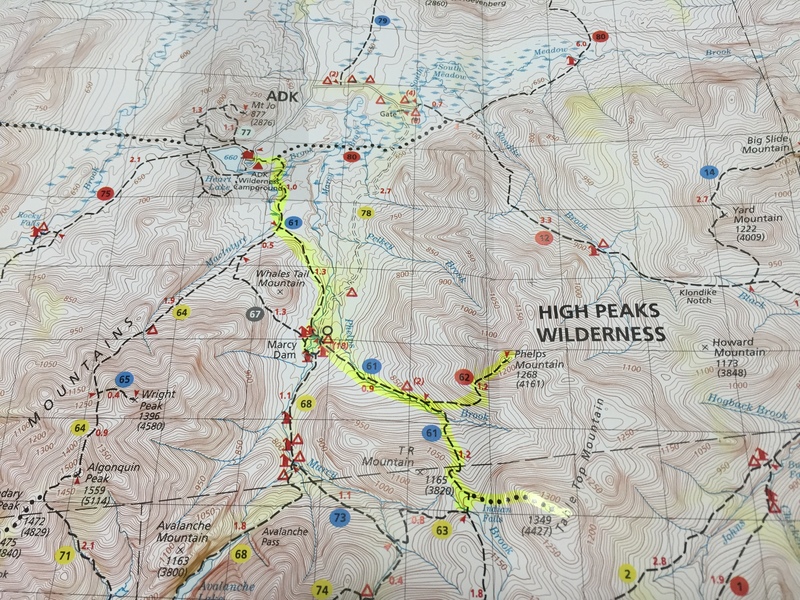 I left the ADK Heart Lake trail head at 7:17 AM and hiked to Marcy Dam, along th trail towards Avalanche Pass and Lake Golden, then turning uphill to Lake Arnold and Feldspar Brook. The trails were wet and muddy, as they have been all summer. The bog bridges near the Feldspar lean-to were in bad shape with some sections floating. There was a gap with missing boards, but one board was within reach and I was able to rebuild the bridge without having to wade. The trail from the lean-to was a steady steep climb passing through 4,000 feet before reaching Lake Tear of the Clouds. The final hike up Skylight was short and relatively easy. According to legend it will rain if a hiker fails to bring a rock to add to the cairn on the summit. I grabbed a rock, deposited it at the cairn and had lunch enjoying the view of Haystack and Marcy and watching as the hikers who arrived after me stopped at the cairn and deposited the rocks they had carried. I hiked back the way I came and had not even made it halfway when it started to rain. 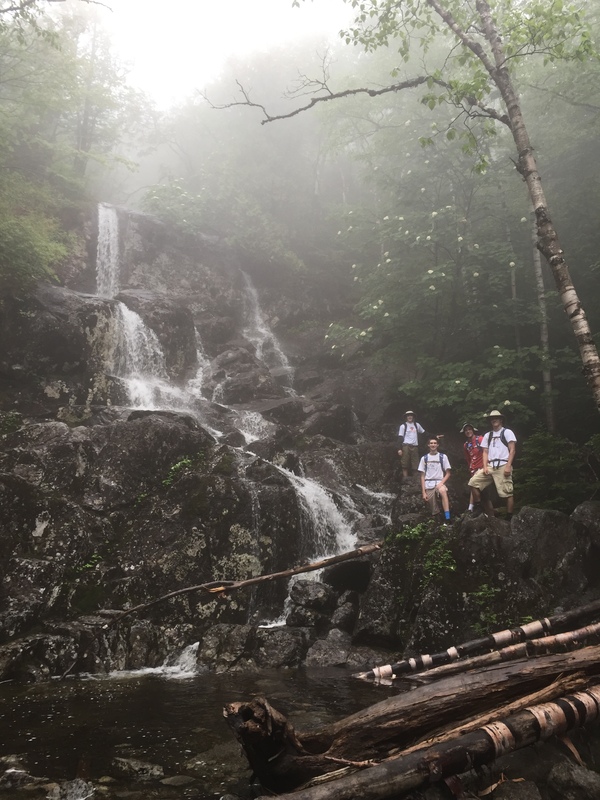 The weather in the High Peaks this summer has been dominated by cold rain, high humidity and afternoon thunderstorms. 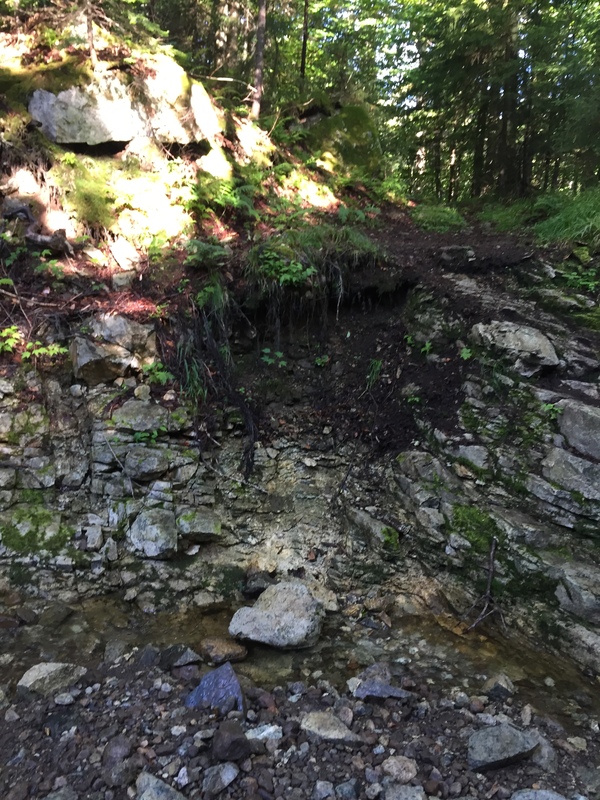 The trails have never really had a chance to dry out since the snow melted and the rocks and exposed roots that are prevalent on the trails are soaked and slippery. The conditions make for very slow hiking, with careful steps and heavy boots coated with mud. 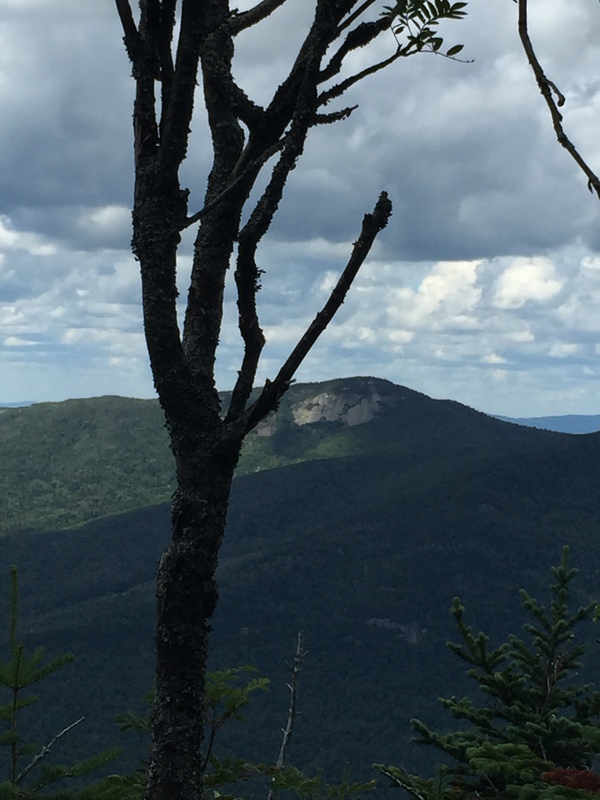 On Tuesday, though, the weather was perfect when I hiked to Cliff Mountain and Mount Redfield from the Adirondack Mountain Club’s Heart Lake trailhead. I signed in at the trail register at 7 AM and made it to the Feldspar Lean-to by 10:30 AM. 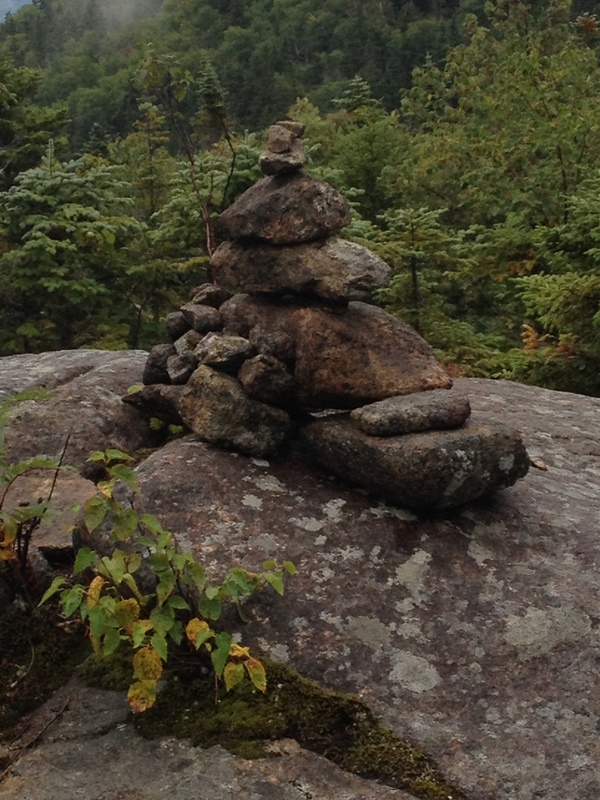 A few minutes later I spotted the cairn that marked the start of the “herd path” trail to Redfield. I met a group of teens and their counselor from a nearby summer camp at the summit and visited with them briefly while they finished their lunches. After leaving Redfield, I turned left at the cairn marking the trail to Cliff. The hike to the summit is relatively short but starts on a flooded trail that leads into scrambles up long and steep rock faces. There’s not much to see at the summit and I headed back home after finishing another sandwich and visiting with a mother and son who arrived at the summit just behind me. On Thursday I met Andy and Adam at the Noon Mark Diner. We had reservations at the Johns Brook Lodge and planned to stay there through Sunday. Adam and I hiked together two summers ago during a backpacking trip over Giant Mountain and along the Dix range to Elk Lake. He brought his father Andy along on this trip before heading to California to start graduate school. It started to rain shortly after we signed in at the Garden trailhead register and we were soaked by the time we reached the lodge. We were assigned three bunks in the ten bunk room and spent the evening visiting with the other guests and talking about the hikes they had taken and the ones they hoped to take in the days ahead. 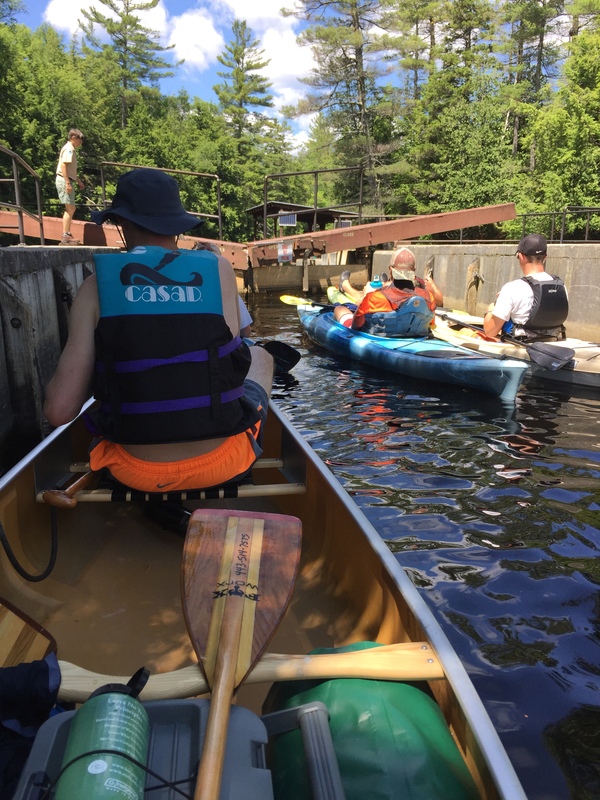 The lodge runs on propane fuel and the electricity generated from four small solar panels, which is stored in car batteries and powers the pumps, filters and chlorination system that sanitize the drinking water drawn from the nearby brook. A helicopter is used each spring to transport to the property the cylinders of propane used for lighting and cooking and the empty plastic barrels that are used in the latrines. The helicopter returns at the end of the season to retrieve the empty propane tanks and the latrine barrels that have been filled during the summer. Perishable food is backpacked in as needed by the staff who cook the meals, change the latrine barrels and maintain the property. On Friday we hoped to climb the “Ha-Ba-Sa,” by first hiking over Little Haystack to Haystack before backtracking to summit Basin and then Saddleback by climbing up the Saddleback Cliffs. The trails were wet and muddy from the rain the day before and it took us much longer than estimated to reach Haystack. 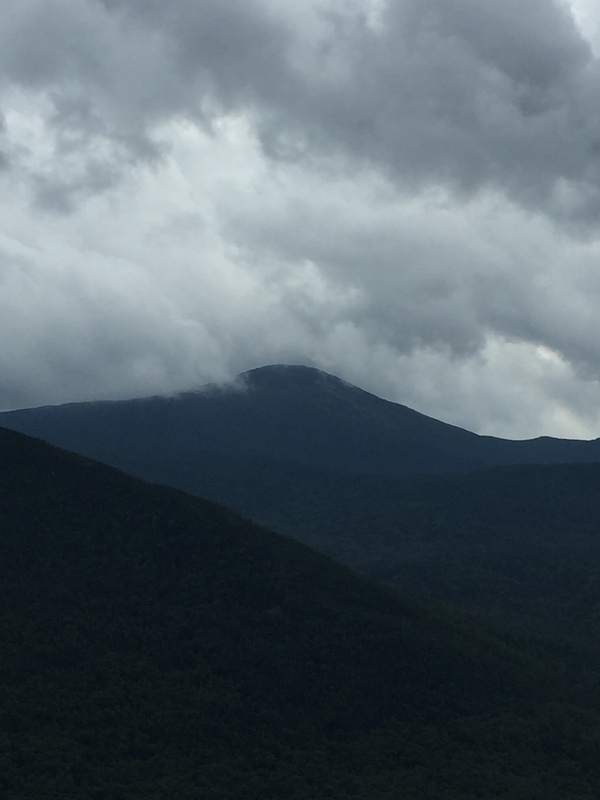 We waited to watch the clouds lift and reveal Mount Marcy to us for the first time during our trip. Dark clouds were forming on the horizon when we left Haystack and thunder followed a short time later. Rather than push on and risk finishing after dark we decided to turn back for the lodge and to return on Saturday to pick up where we had left off. Unfortunately, it started to pour shortly after dinner and it rained steadily into the next morning. By the time we awoke the trails were drenched and too slippery for hiking so we decided to leave Basin and Saddleback for another day, cut our trip short and hike out to our cars. I had planned to hike to three peaks during the visit to the lodge, but settled for only one. And while some could say that the trip was a washout, one of the lessons I’ve learned along the way on this journey is that the mountains will be here forever and it is okay to leave a summit for another day. Especially because there is nothing more spectacular than to be on the top of New York after the clouds have lifted away. 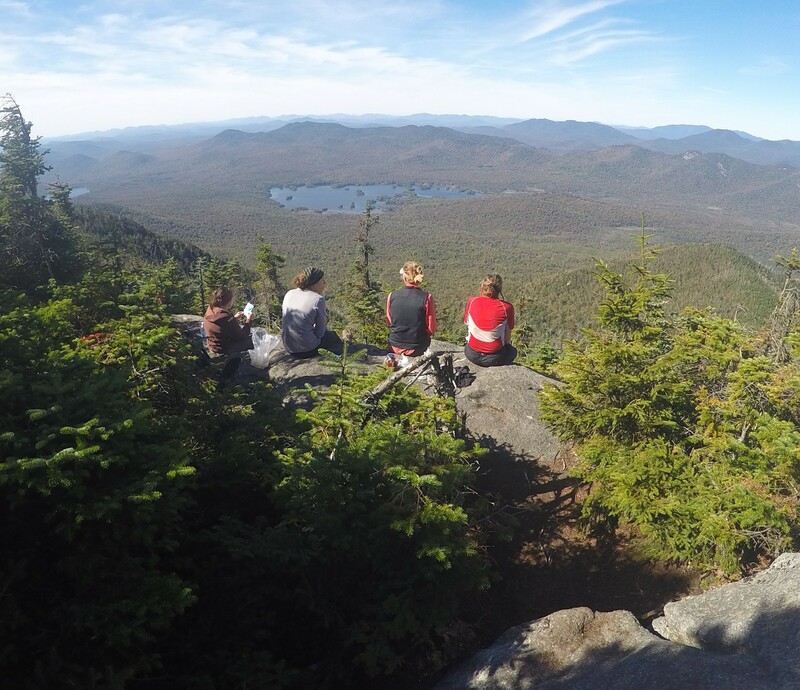 Bryce, Julie, Aleah and I left Lake Placid on Thursday at 6:45 AM to hike along Lower Ausable Lake to Sawteeth Mountain and then over Pyramid Peak to Gothics Mountain. 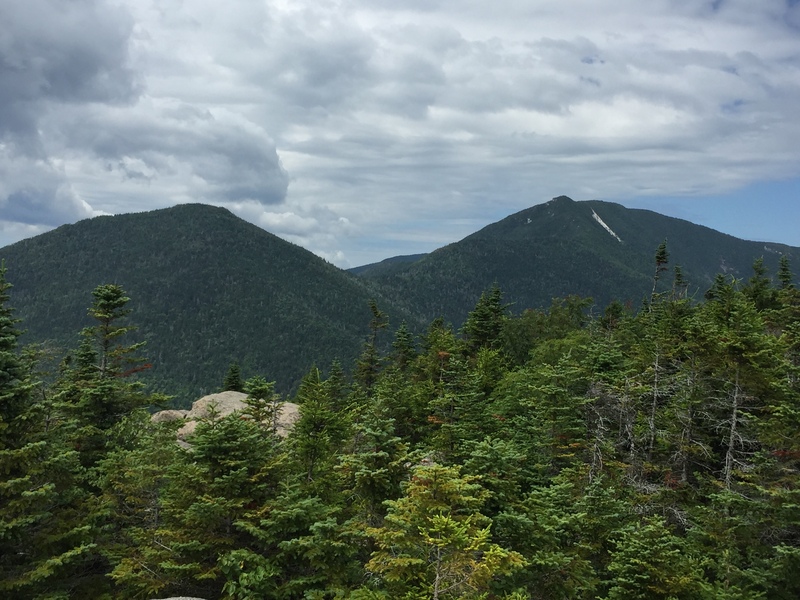 It had been nearly a year since my last hike in the High Peaks and despite my efforts to keep in shape by biking, taking long walks and skipping the elevator whenever possible, Thursday’s hike was hard. We chose the “Scenic Trail” to Gothics and saw spectacular views as we climbed out of valley. Unfortunately the trail is very steep at first, with almost a mile and a half of constant climbing before easing a bit, and I was exhausted by the time we reached to intersection with the trail to Marble Point. We stopped at the Sawteeth summit for a few minutes before continuing on the Pyramid Peak, a little less than a mile away. I felt fine as we descended into the col between the peaks but found the climb to Pyramid very difficult. It was hot and humid and I could not keep up with my hiking companions. Upon reaching Gothics, I finished my lunch and saw in the distance Big Slide Mountain, which I had hiked to three years ago with other friends. When I decided to climb the high peaks, I climbed the first two peaks alone. 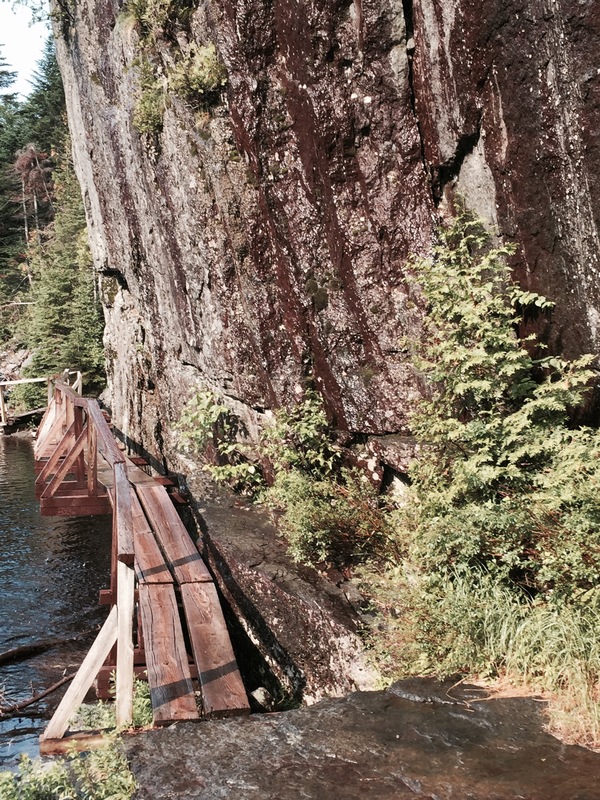 Then, on August 30, 2014, two friends joined me on a hike to Big Slide. When we reached the summit that day I took this picture and showed them how to orient a map with a compass and to use it to help us identify the peaks across the valley. I remember wondering then when I would be on the other side of the valley looking back at Big Slide. Thursday was that day and I am a bit sad because I have not seen the friends who were with me on Big Slide in a long time. The swimming pool where we first met was torn down to make way for a parking garage and we have each moved on, heading in different directions, focused on other things. When it is time to leave Gothics, I am the last off the summit, pausing to take one last look at Big Slide. I returned on Saturday, with a larger group, to hike up the opposite side of the valley to Dial and Nippletop mountains. I have hiked with this group twice before. 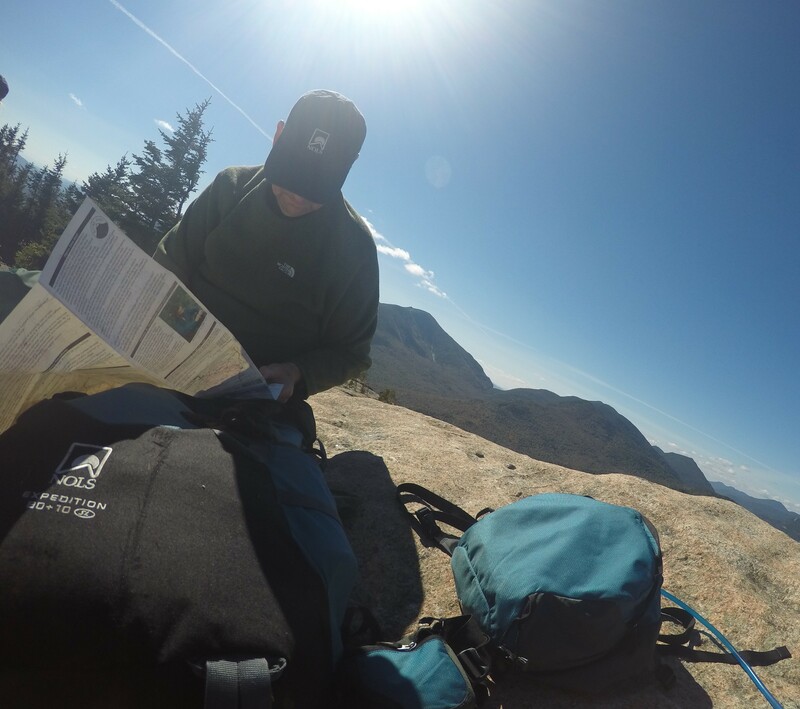 Our first hike together was to Grace Peak and last year we hiked to Pitchoff Mountain one day and over Mount Marcy the next. Everyone in the group has an Iron Man Lake Placid connection. Three of us competed in the 2014 race and regularly share stories of our experiences finishing the swim in the middle of a lightning storm before biking into the Keene valley with water sheeting across the road. Others in the group completed the race in different years or came to cheer on friends and family members. For Saturday’s hike, we chose an approach that was gradual on the climb up but very steep on the descent. Although this made for a slow return to the trailhead from the summit of Nippletop, we were all less tired when we finished than we would have been had we hiked in the opposite direction. With these four hikes complete, I have only 14 more to go to meet my goal of becoming a 46r on August 1, 2018. Every hike has been difficult but I have loved them all. And although I have lost touch with some who have joined me on this journey, I will never forget the friendship they showed me along the way. 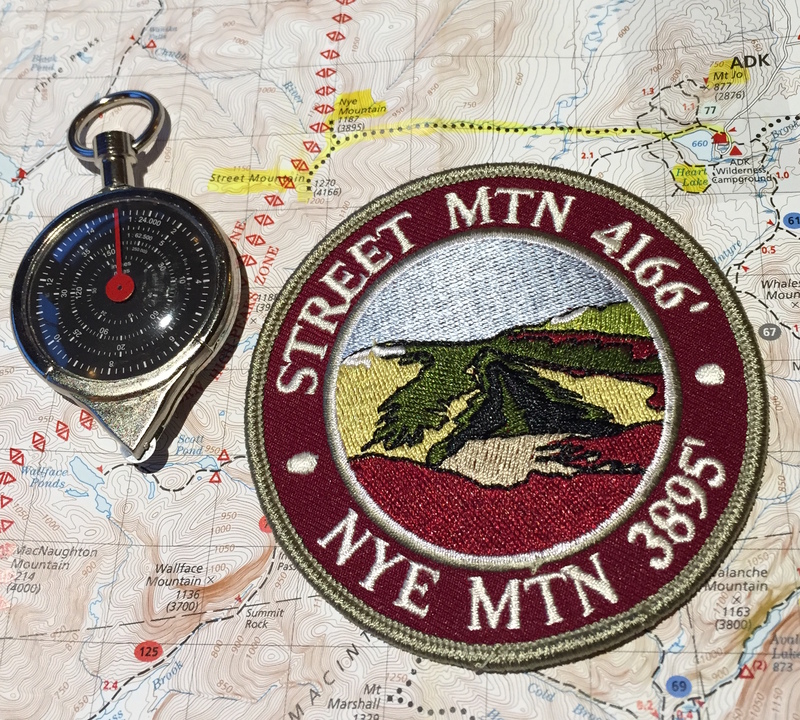 Today I hiked to Nye Mountain and Street Mountain, my 18th and 19th peaks on the way to 46. The hike was straight-forward and not that difficult. I left the parking lot at 8:47 AM, reached Nye at 11:00, had lunch on Street and was back to the car a few minutes after 2:00 PM. Both peaks are covered with trees and the views are not as spectacular as the views from other nearby peaks. On the way down I catch a glimpse of Heart Lake and remember the story about how it got its name. 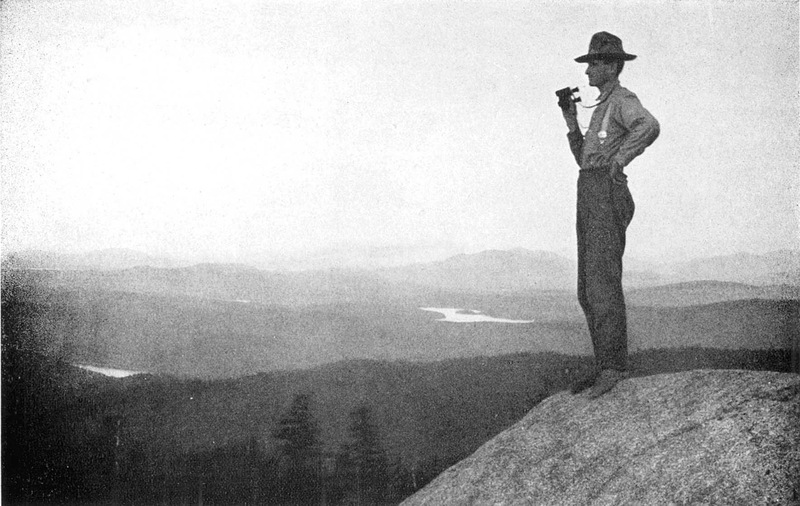 According to the legend Henry Van Hovenberg left New York City in 1877 and visited the Adirondacks. He met a young woman, Josephine Scofield, and together they climbed Mount Marcy where he pledged his love to her. Looking out at the valley below them they saw a heart-shaped lake and decided that they would marry and build their home on its shores. They returned to New York City together before Josephine left for a trip Toronto. On her way she stopped outside of Buffalo and was never seen again after taking a walk to the edge of the Horseshoe Falls. Heartbroken, Henry returned to the Adirondacks in 1878, bought the 640 acres around the lake and built a hotel where he had planned to build his home with Josephine. He renamed the lake Heart Lake and a nearby mountain Mount Jo in honor of Josephine. Recent attempts to verify this story have failed and many people now believe that Henry made up the whole thing as a marketing ploy to romanticize his hotel. 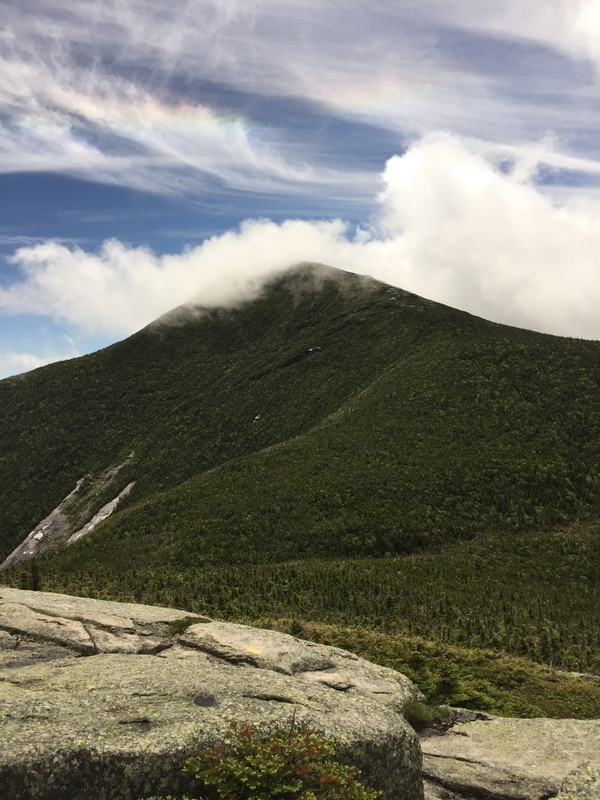 Even though there probably never was a Josephine, I suspect that at least once in the last 138 years a man and a woman hiked together to Mount Marcy and fell in love while looking down at Heart Lake and the beauty spread out before them. That is the true story of Henry and Jo. 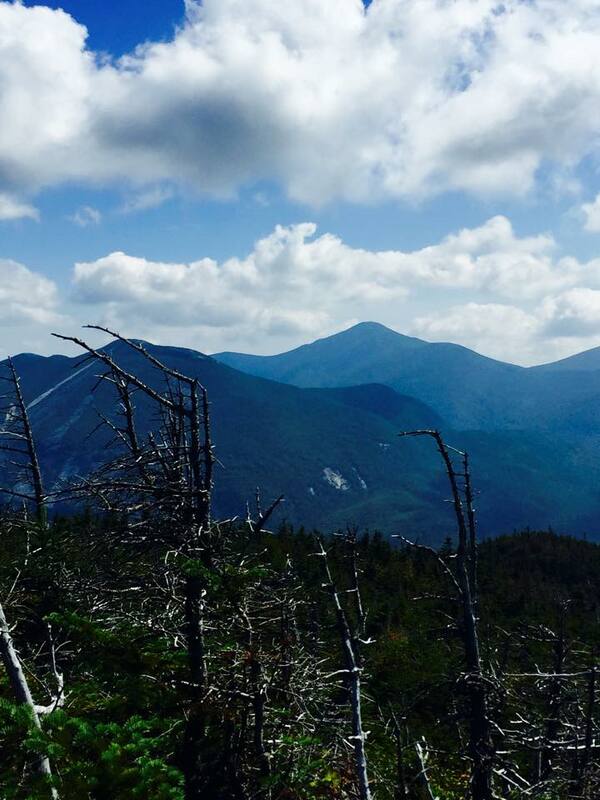 Last Thursday I hiked to Iroquois Peak. Leaving from from the Adirondack Log trailhead just before 7:00 AM, I stop at the McIntyre Brook waterfall at 8:21 AM, pass over Algonquin at 9:55 and reach the summit of Iroquois just before 11. While enjoying a sandwich on Iroquois I remember back to July of 1975 when I worked as a counselor at Crumhorn Mountain Boy Scout Camp. I taught merit badge classes and lived in a large canvas tent with a wooden floor. I was a pretty good instructor but what I loved most about that summer was the ceremony we held every Friday night to recognize scouts selected for the honor of joining the Order of the Arrow. It began just after dark in the middle of Lake Crumhorn where about twenty of us waited in the camp’s fleet of canoes. When the scout troops were all assembled in front of the mess hall, we lit torches made with strips of old tent canvas dipped in Kerosene and paddled to shore. For the next forty minutes we told the legend of the Lenni-Lenape, a peaceful tribe that inhabited the Delaware River Valley long ago. When neighboring tribes started to raid their hunting grounds Chief Chingachgook asked “Who will go to the villages of the Delaware and warn them of the danger that threatens?” No one stepped forward except his son Uncas who volunteered and ran from village to village to provide the warning and recruit others who would volunteer their service for the good of the Lenni-Lenape. In our ceremony Dave Jones played Chingachgook. I was Meteu, the medicine man, and Eddie Frazier played Uncas. I opened the ceremony by dancing around the council fire, pausing four times to chant a Lennai-Lenape blessing while shaking the large rattles I carried. Dave recited the legend of the Lenni-Lenape and then Eddie sprinted past the gathered campers tapping the new recruits on the chest as Uncas had done when he travelled from village to village to gather volunteers. Try as I might I cannot remember the words to the songs we sang on those Friday evenings long ago other than the opening line Dave sang after I finished the blessing. I leave Iroquois singing it over and over again hoping that the rest of the words will eventually come to me. They do not, but I smile anyways remembering that amazing summer in 1975 when I played a medicine man who danced around a council fire. 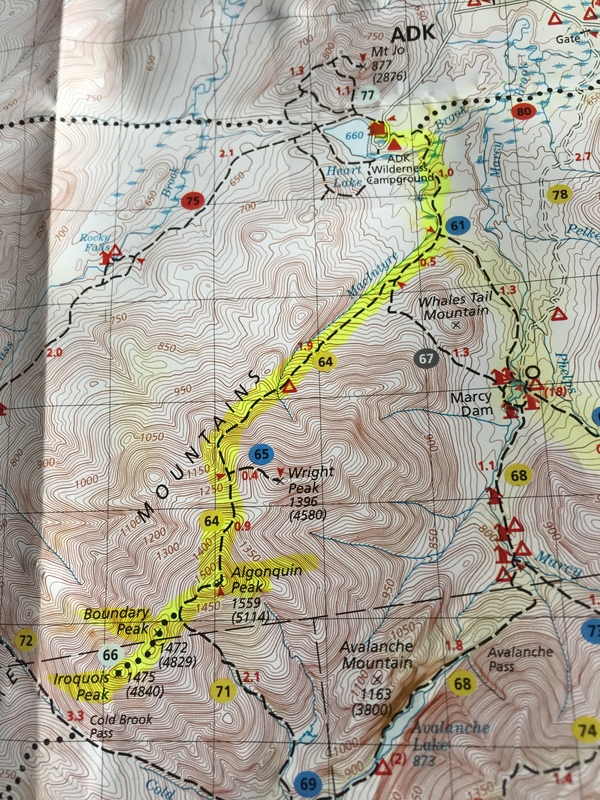 My hike to Table Top and Phelps starts later than usual and I don’t depart from the Adirondack Loj trailhead until 8:49 AM. 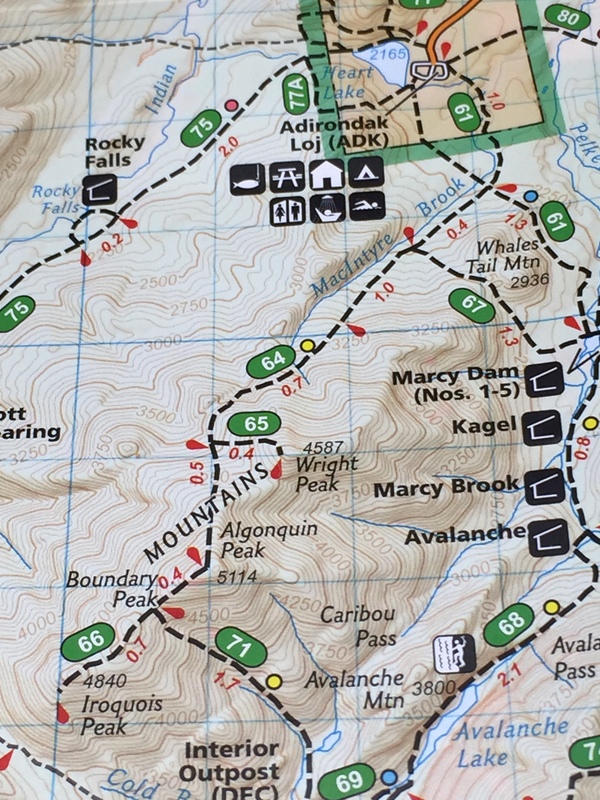 I cross below Marcy Dam at 9:38 and follow the blue trail as it climbs along Phelps Brook before veering south towards Mount Marcy. 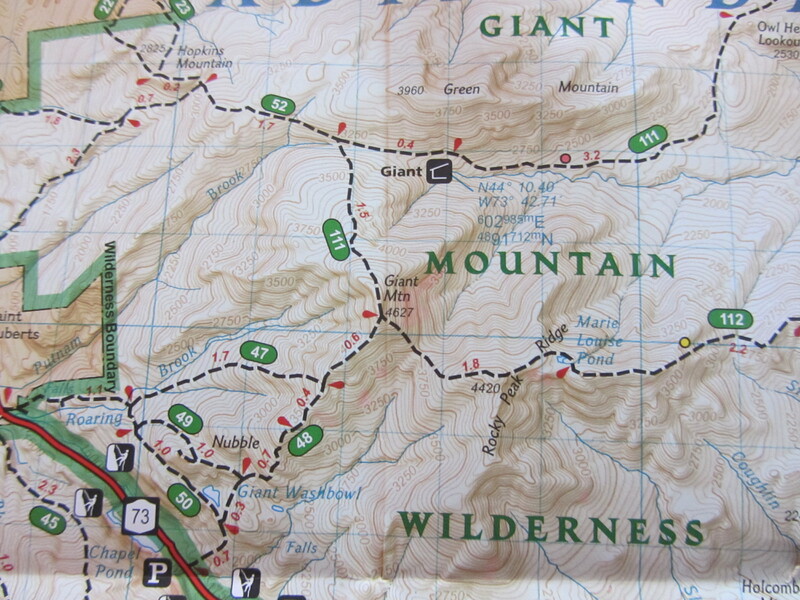 My plan today is to hike to Table Top Mountain and then climb Phelps Mountain on the way back to the trailhead. It is hot and humid and I stop at the second to last crossing of the brook to refill my water bottles. A father and a son pass by me as I sit on a rock waiting for the Steri Pen to finish. 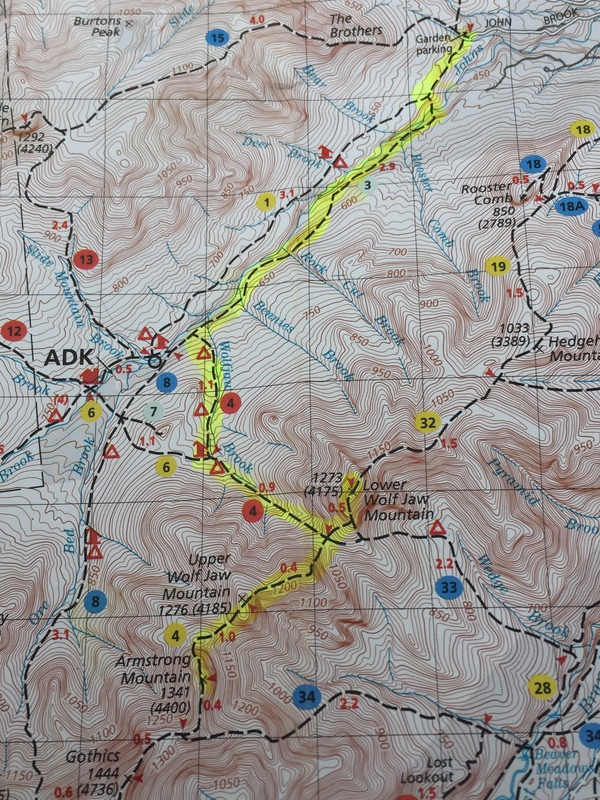 We exchange hellos and they continue up the blue trail. The boy is a chatter box and appears to be about ten years old. His father is quiet. They are well prepared for the hike carrying day packs and wearing well-worn ankle high boots. I wait a while longer to give them space before rejoining the trail. I hear this exchange several more times as they continue the climb and think that there is no better answer to the boy’s question. When I reach the summit they are having lunch on a rock ledge. The father identifies by name the peaks that are spread out before them and the son asks about the trails to each and the father shares his memories from having climbed them in year’s past. After they leave I finish my sandwich as a storm gathers around Mount Marcy. I start the climb to the Phelps summit at 1:25 PM. This trail is much harder than the trail to Table Top and I have to stop several times to catch my breath. I climb a section assuming that I have reached the top only to find that the trail heads in another direction and starts climbing again. 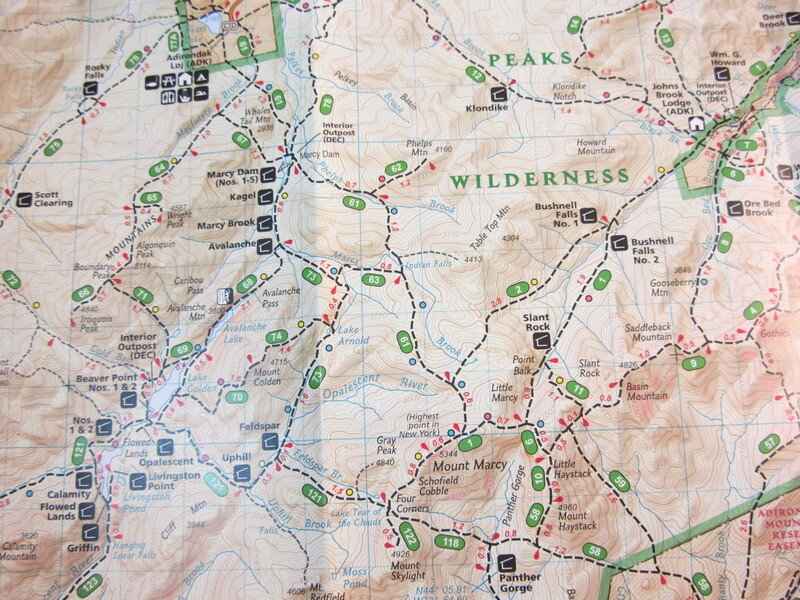 I get discouraged and want to check the map to figure out just how much more is left to climb. Instead I remember the father’s answer to his son and choose not to worry about what lies ahead but rather to be proud of what I have accomplished thus far. 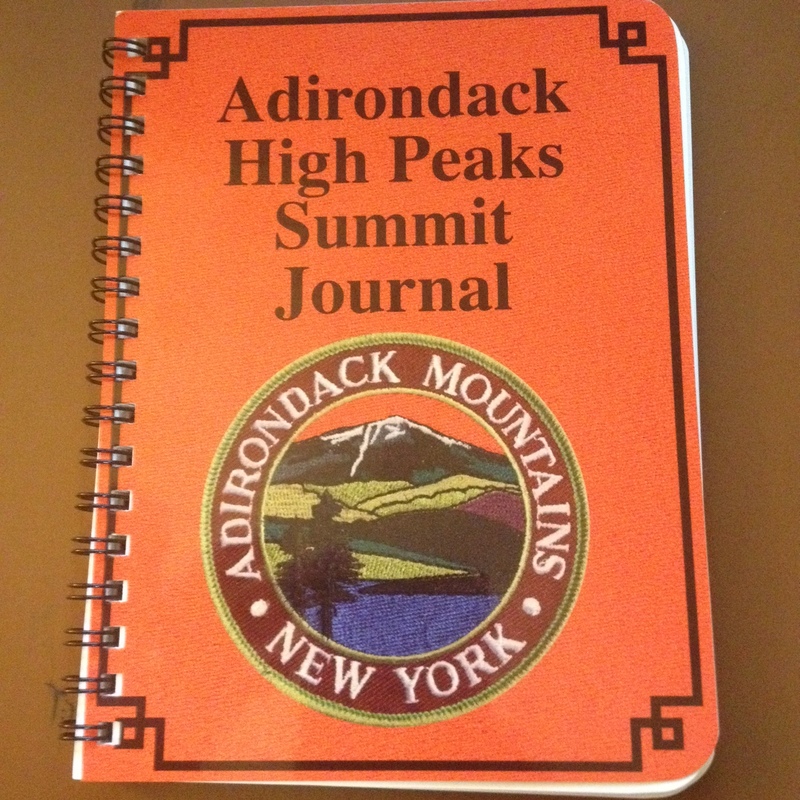 One of the reference books I rely on to plan my hikes is the 14th edition of the Adirondack Mountain Club’s “High Peaks Trails” (2012), edited by Tony Goodwin and David Thomas-Train. 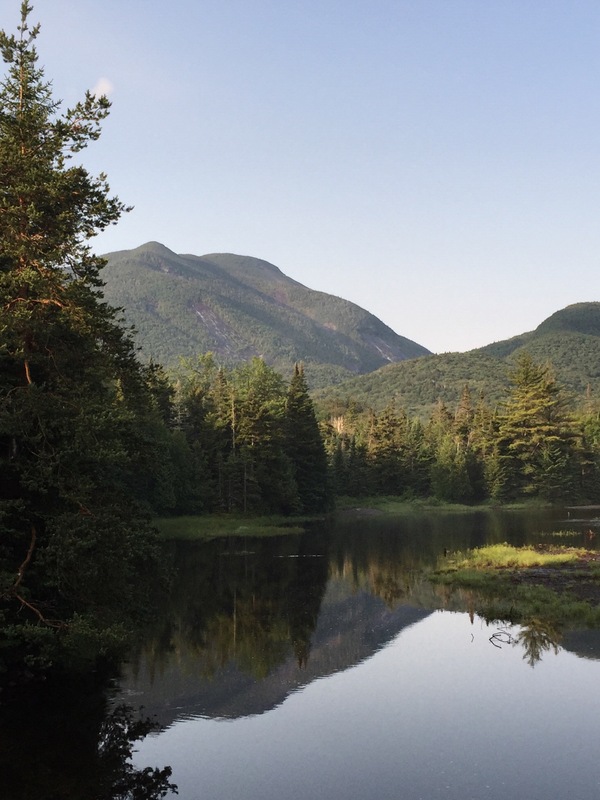 This most northern of the major Adirondack peaks is named for Esther McComb. 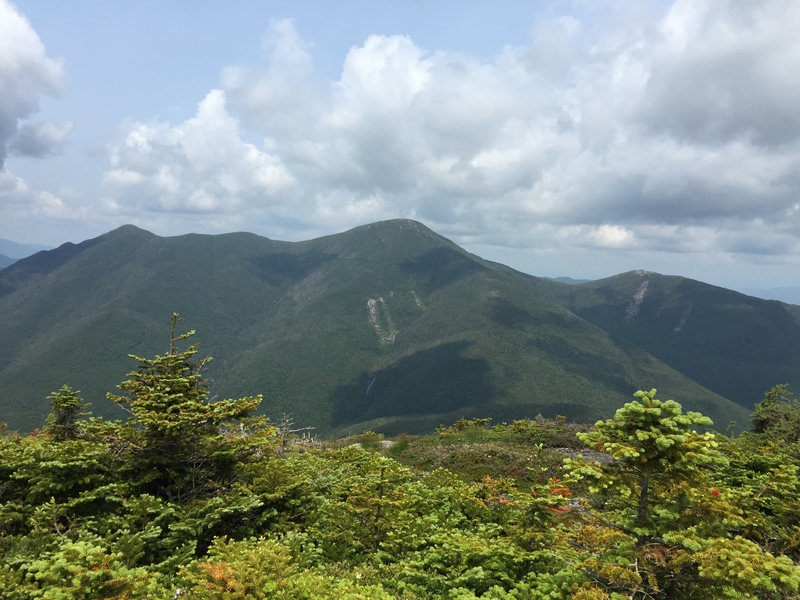 In 1839 at the age of 15, while trying to climb Whiteface Mountain from the north, she became lost and made of the first recorded ascent of this mountain instead. 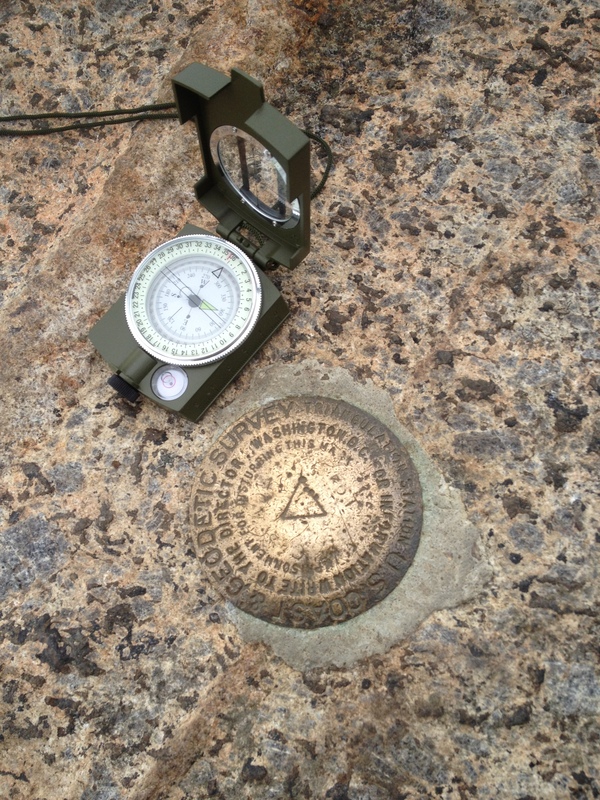 The Adirondack Forty-Sixers placed a tablet to her memory on the summit in 1939. I decide to start from the trailhead just of route 86 after it crosses the West Branch of the Ausable River. I start at 7:00 AM by following the trail to Marble Mountain, much of which can be used by mountain bikes. There are no particularly difficult parts on the hike, just a steady climb. I have the trail to myself and reach the top of Marble Mountain at 8:25 and head southwest on the trail that leads to Whiteface Mountain. Soon I hear snippets of a conversation and realize that a couple is behind me, having started from a different trailhead. I reach the Esther Mountain trail junction at 9:33, pass over Lookout Mountain at 9:44 and am enjoying my sandwich on Esther when the couple finally catch up. We exchange hellos. They are from Connecticut and are surprised to hear that I regularly drive to Lake Placid from Baltimore. We gather around the plaque and compare notes about Esther McComb. My story is that she got lost trying to climb Whiteface. Her story is that Esther was never found. His has a happier ending; she was lost while trying to find her father who was surveying Whiteface but he rescued her. I like his story best. I am amazed at the possibility of being lost on this mountain. It is desolate at the top of the peak. I have no idea what the forests here were like in 1839, but today they are impassable. Every inch is covered by the boughs of pine trees and the trail is very narrow and nearly overgrown. It is cold and very windy. 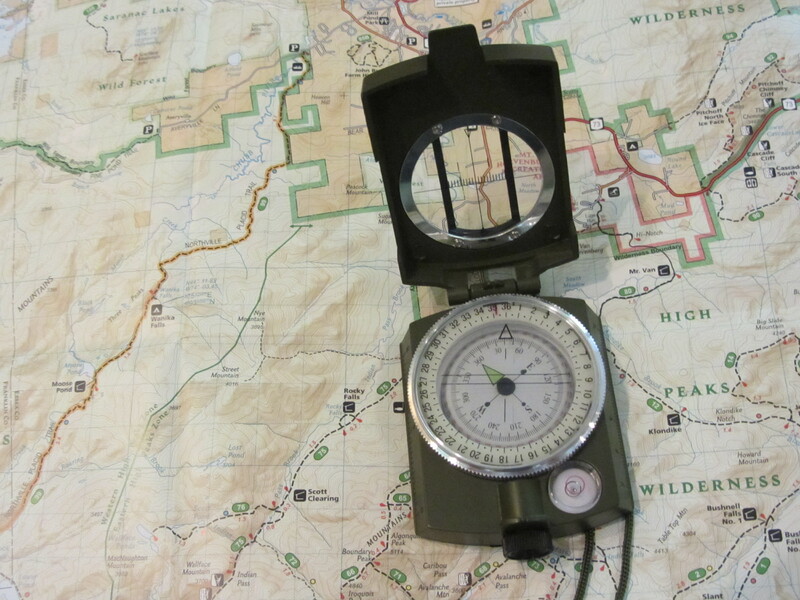 A terrifying place even with a well-defined trail, a compass and a map. 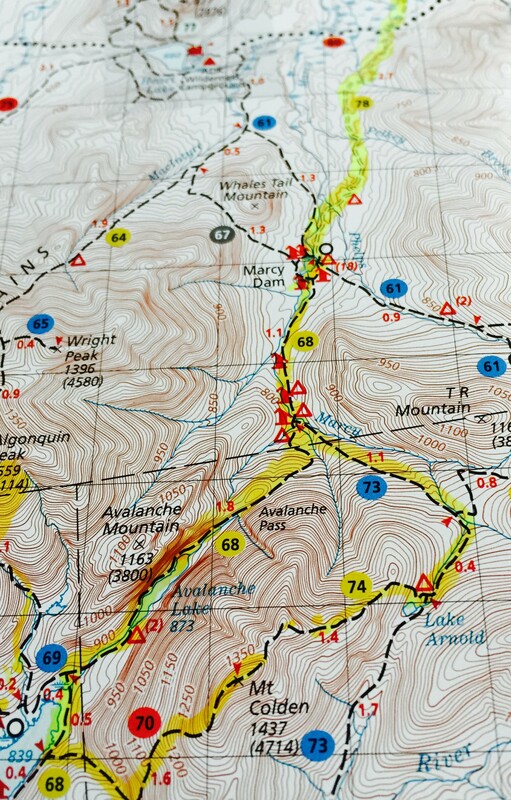 None of the information uncovered by Sandra Weber was available in 1939 when Grace Hudawalski, for whom Grace Peak is named, and her husband decided to organize a celebration to commemorate the one hundred year anniversary of the legendary ascent with a plaque placed at the summit in Esther’s honor. For many years, at her summer home near Adirondack on Schroon Lake, Grace Hudowalski had on her porch a summit register canister which had once been fastened to a tree at the top of Esther. Esther Mountain meant a lot to her. 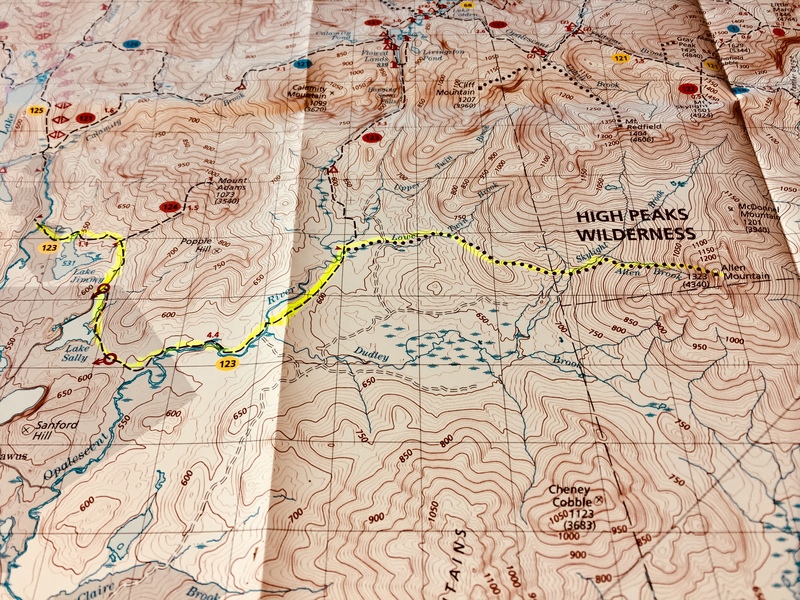 After reading Russell Carson’s “Peaks and People” and having determined that she would climb the 46 peaks, Grace decided that Esther Mountain would be her finishing peak. Thus it was that she became 46er #9 on Esther Mountain on August 26, 1937. She was the first woman to complete the 46 and the first 46er to finish on Esther. 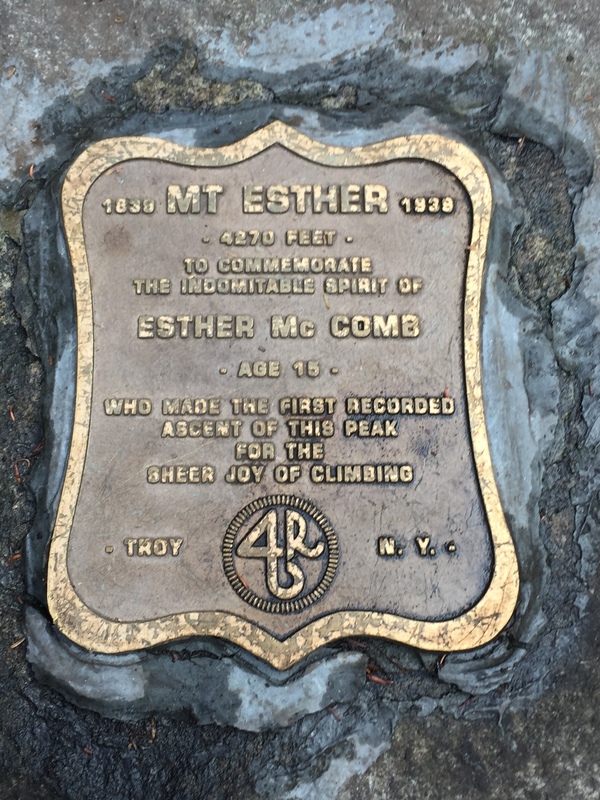 She championed and celebrated Esther McComb….but is possible, just possible, that the first woman to climb the mountain “just for fun” was Grace herself. 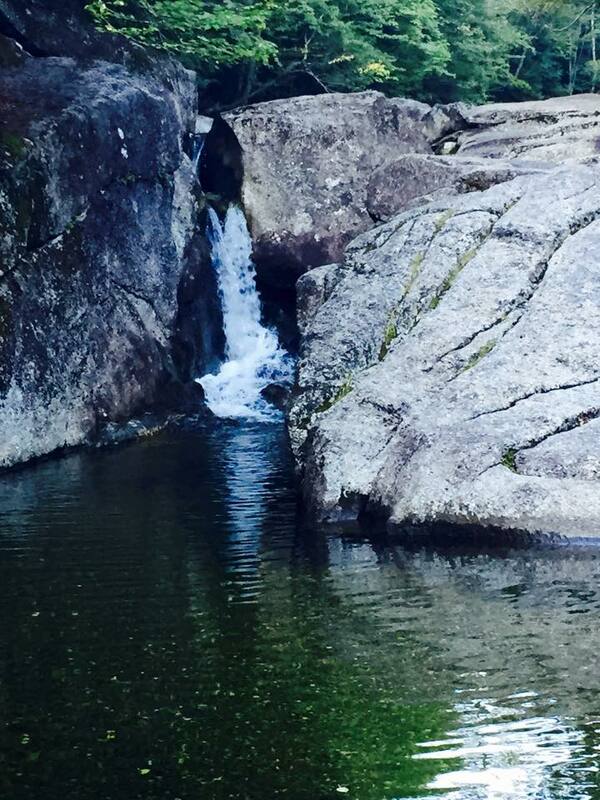 In Adirondack Park, ADK 46-R	Esther McComb, Grace Hudowalski, Heaven Up-h'isted-ness! My plan was to climb three peaks to bring my total to thirteen. I thought I would finish in seven hours. Ten hours later I still had a few miles to go. 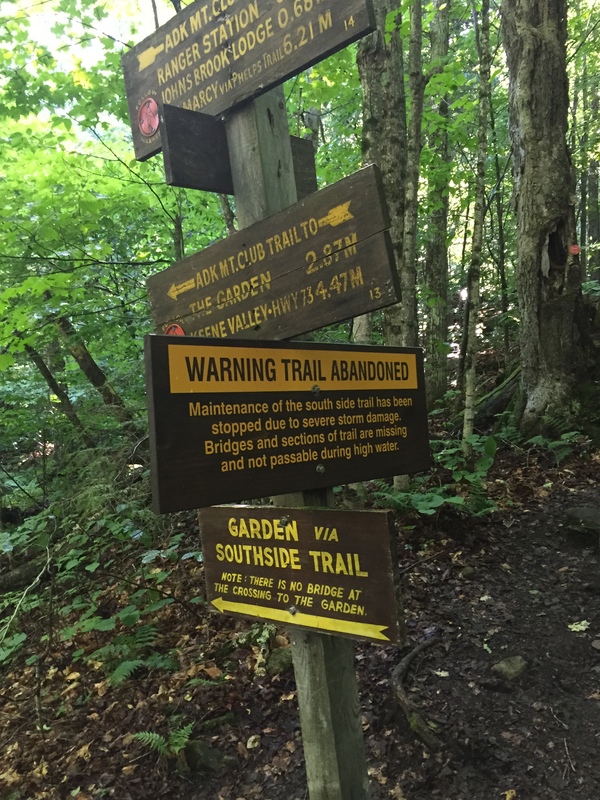 I started at the Garden trailhead and decided to take the Southside Trail ignoring the signs warning that it had been abandoned. 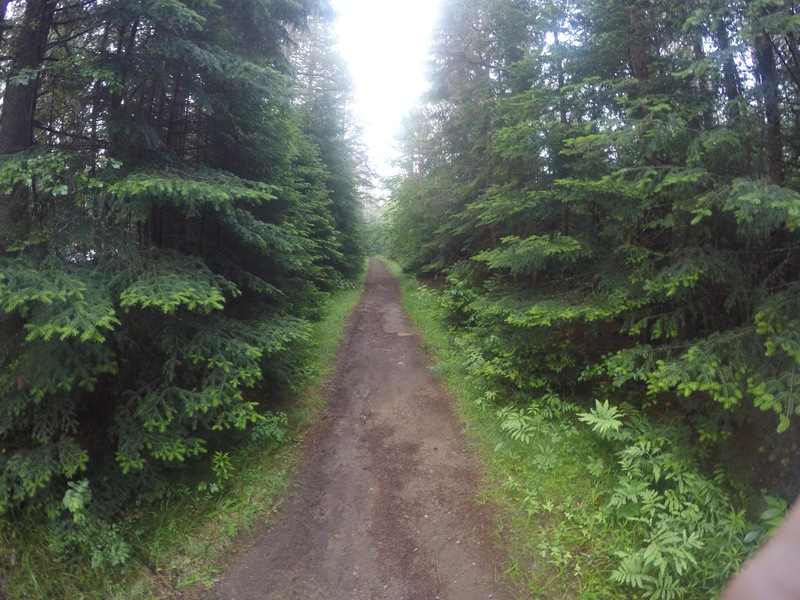 The trail is an old forest road that for the most part is in remarkably good shape. But then it disappears, having been violently washed away and into the Johns Brook. The trail steepens after crossing Wolf Jaw Brook and I reach the Wolf Jaw Notch just before ten o’clock. I decide to turn right and head first to Upper Wolf Jaw Mountain. I am hiking alone today and am cautious at every tricky part. Others are not. I am passed by a young man running his way to the summit and I meet other groups heading up and down the trail at paces much quicker than mine. 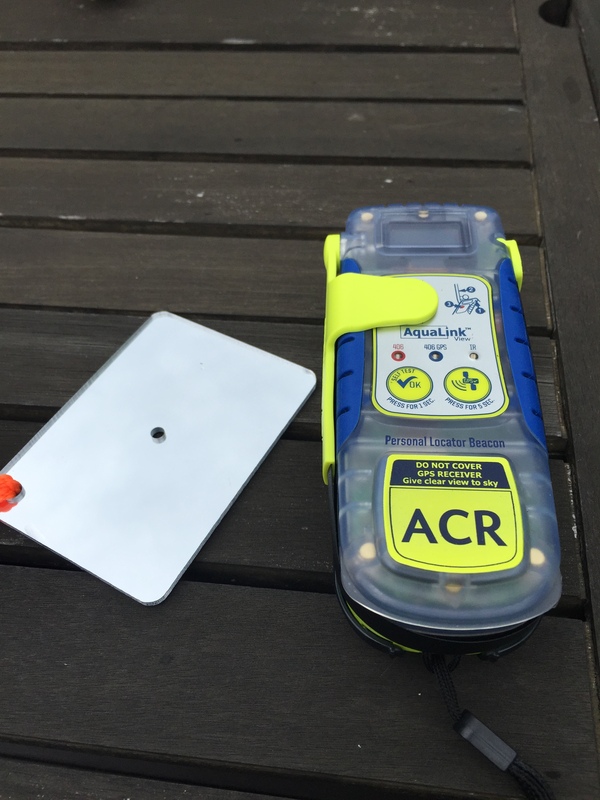 I carry two forms of emergency communication, an ACR personal locator beacon and a signaling mirror that is a hold over from my days as a Boy Scout. It is doubtful that the mirror will be of much use in an emergency given the dense tree cover over head but I like having it and knowing how to use it. 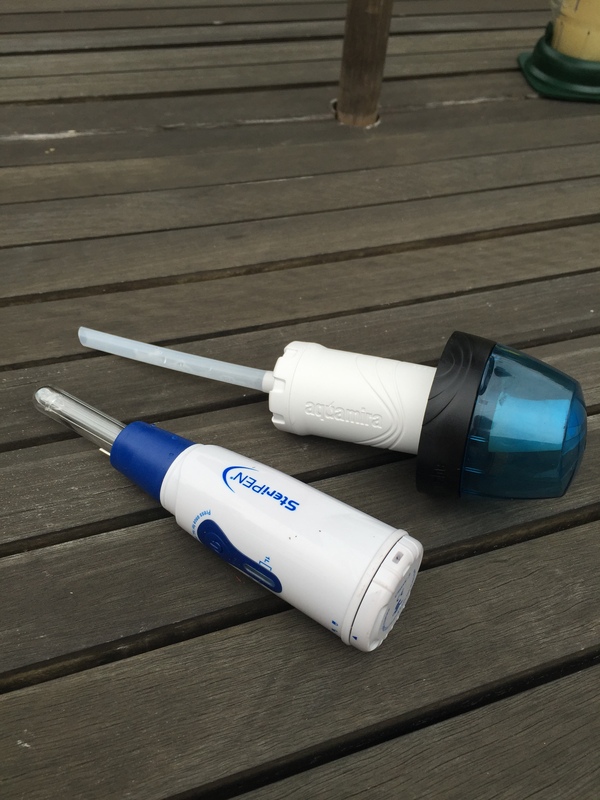 The locater beacon communicates with satellites. Although it is surprisingly heavy I always bring it because it provides me with the reassurance I need to hike these trails alone. In my earlier hikes I carried a day’s supply of water in a Camelback bladder. Now I bring two water bottles, a filter and a UV water purifier and drink water from the streams and brooks I pass along the way. 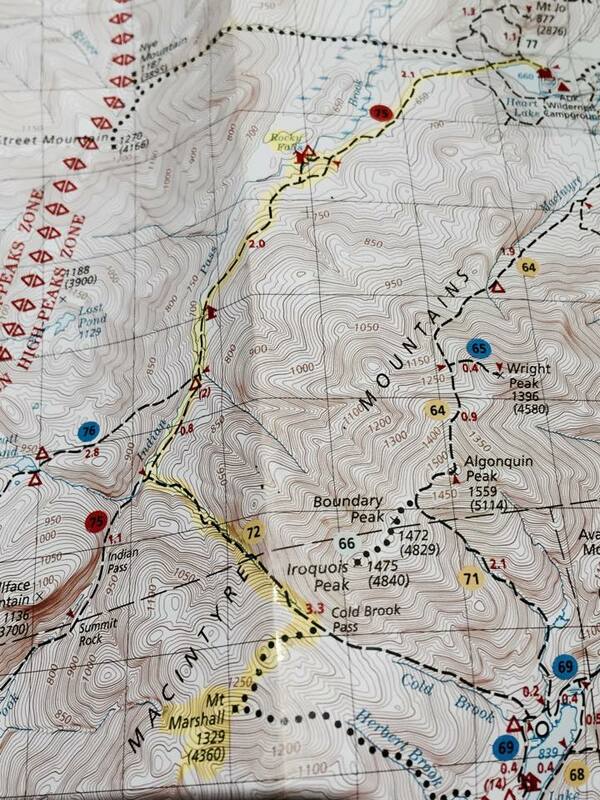 There are two peaks on Upper Wolf Jaw Mountain, I reach the highest one at 10:56. It takes me another hour to reach Armstrong Mountain. I stop for just a minute and turn back, recrossing Upper Wolf Jaw on my way back down to the notch. I am very tired when I start the climb up Lower Wolf Jaw Mountain. I reach its summit at just before two o’clock and stop to enjoy my last sandwich. Peering across the valley I spot Big Slide Mountain and remember fondly my hike there with two friends last Labor Day weekend and how we sat eating lunch staring at the mountaintop where I am now. 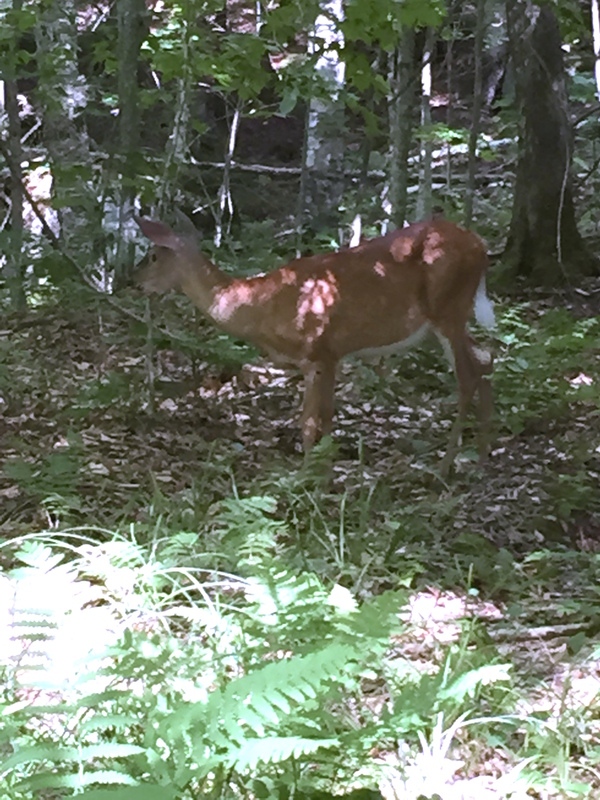 During that hike we came upon a young deer just as we entered the trail. I think I may have met her again today. The planned hike was an ambitious one. 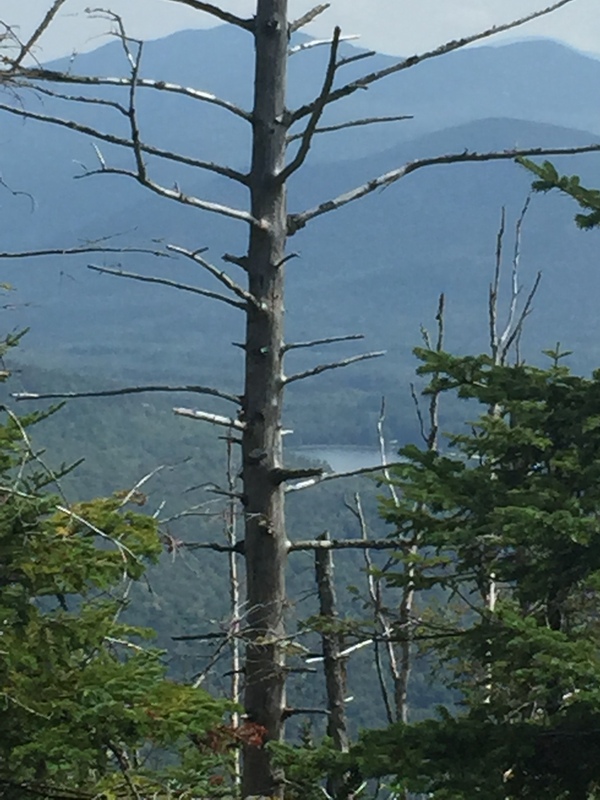 Meet for coffee at 7:00, reach the trailhead by 7:30, follow an unmarked trail to the start of the Dix Mountain Range and hike to four of the high peaks before returning to Round Pond. 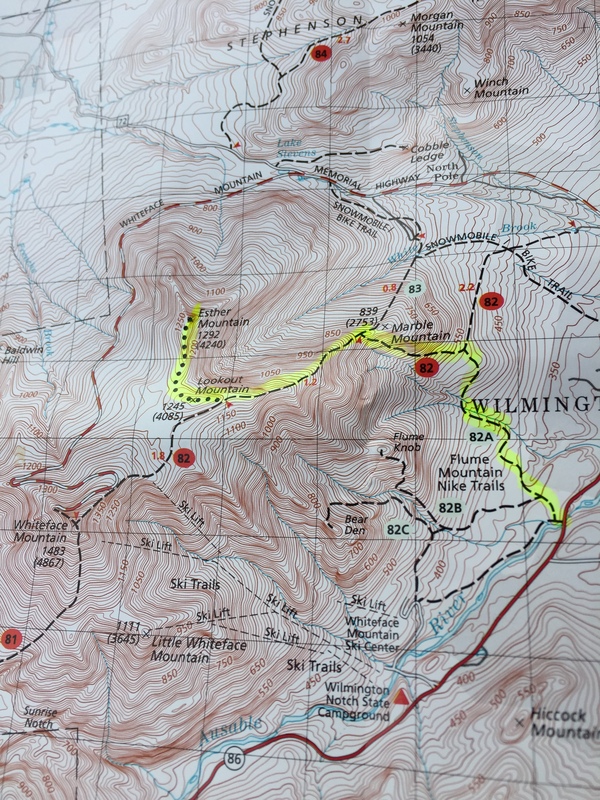 The hike would cover nearly sixteen miles, the first seven of which were along unmarked paths to the first peak. Her name is Grace and it fits her perfectly. She is simple, elegant and set apart from the other four in the range. She is hard to reach because the path is not that obvious and the several crossings of the South Fork of the Boquet River are hard to find. When you get closer to her the trail improves but then gets very steep. The view from the summit is breathtaking and we sit silently eating sandwiches and surveying the three remaining peaks we had hoped to reach. They are too far away and separated by valleys that are much deeper than we expect. It has taken too long to get here and there is not enough time left to complete this journey. We decide to head back the way we came and to leave the remaining three for another day. It is beautiful here and I really do not want to leave. I try to convince myself that I will visit Grace again, but I know it will likely not happen. She stands alone, away from the others and no longer on the way to anything else on my list. I regret this deeply because I have loved this hike more than any of the others I have taken. Mount Colden, the hard way. 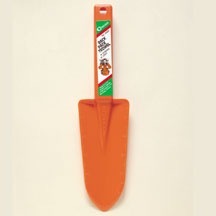 I needed a backpacker’s trowel but there were none at Eastern Mountain Sports. They suggested that I try a hardware store. Trips to the two located in Lake Placid did not turn up the trowel I needed. Almost as an afterthought I stopped into High Peaks Cyclery. Sixty minutes and $126.50 later I left with a new map, first aid kit, whistle, two books and the $1.99 trowel that had brought me there in the first place. While browsing the shelves of camping equipment I met the owner, Brian Delaney. He and his family have been outfitting hikers and guiding trips into the Adirondack wilderness for the last twenty-eight years. 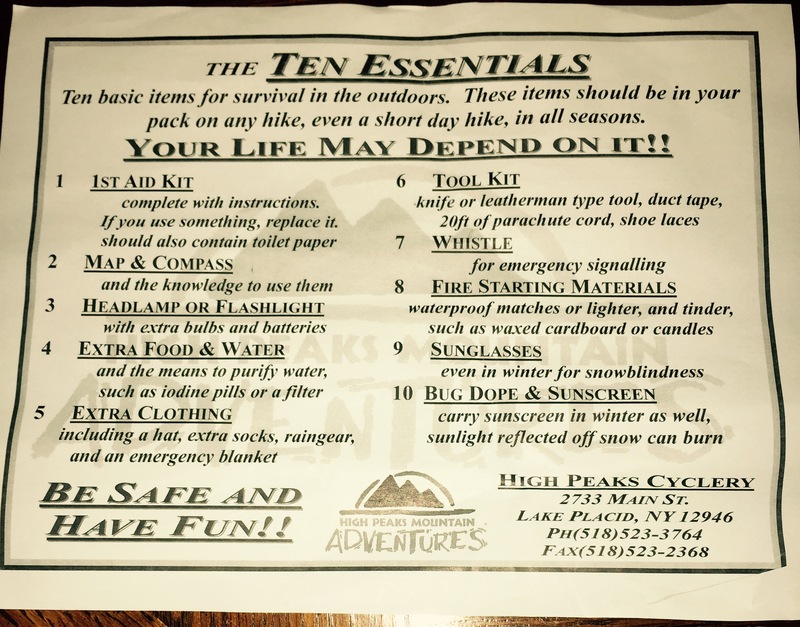 He invited me to sit with him at his map table and after making sure that I had every item on his list of the “Ten Essentials” for outdoor survival he asked me what I had in mind. 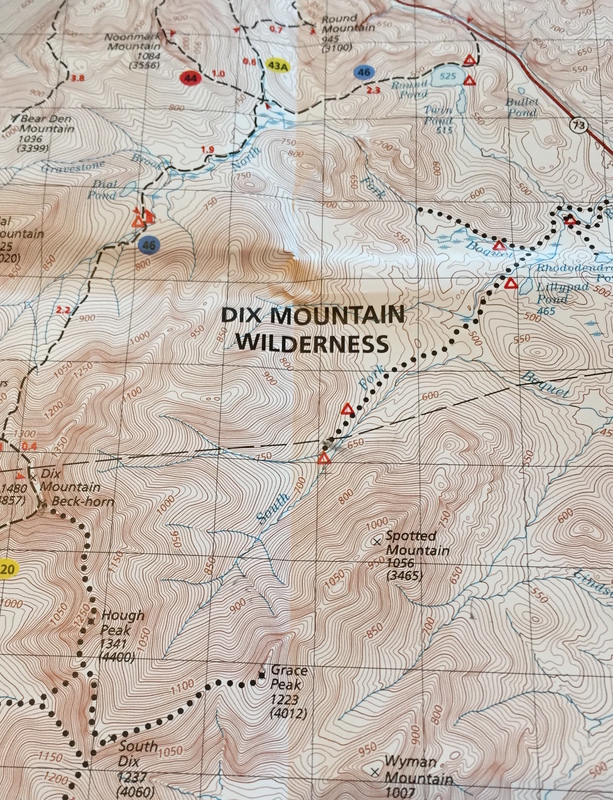 I told him I wanted to hike through Avalanche Pass and climb one of the 46 high peaks. 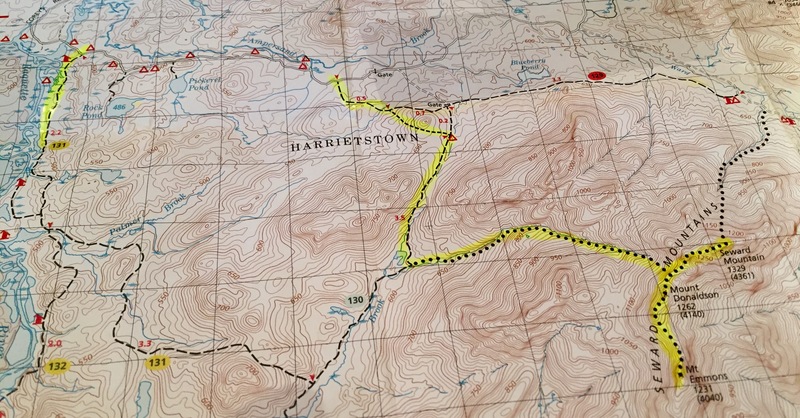 He suggested Mount Colden and marked out a course with a yellow highlighter on the new map he had just sold me. I awoke before dawn the next morning and arrived at the Meadow Lane trailhead at 6:00 AM. From here I followed an abandoned truck road to Marcy Dam, 2.7 miles away. 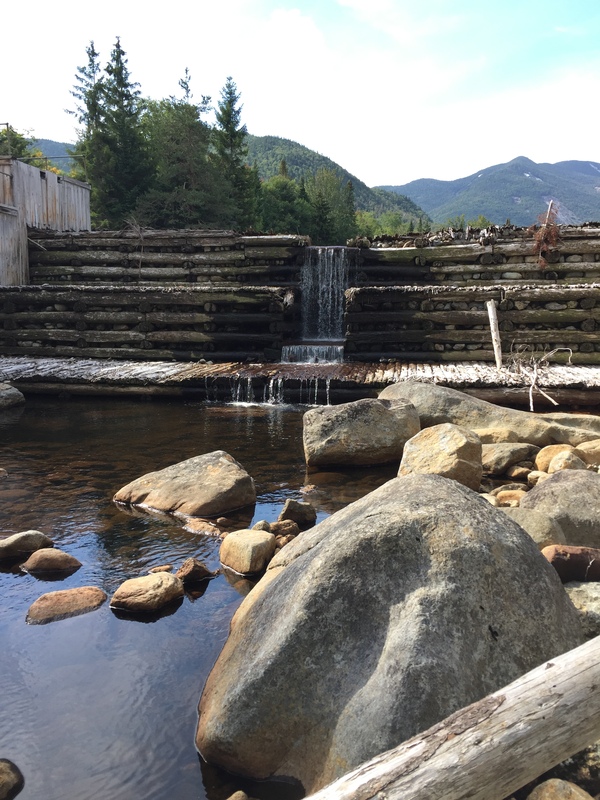 Mount Colden rises from the left behind what is left of the dam. Its distinguishing feature is the pointed false summit in the foreground. There are two approaches to top of the mountain. The more popular trail approaches from the false summit side with a steady, gradual climb. At Brian’s suggestion I take the trail from the back side which is steeper but affords spectacular views of the MacIntyre Mountain Range. 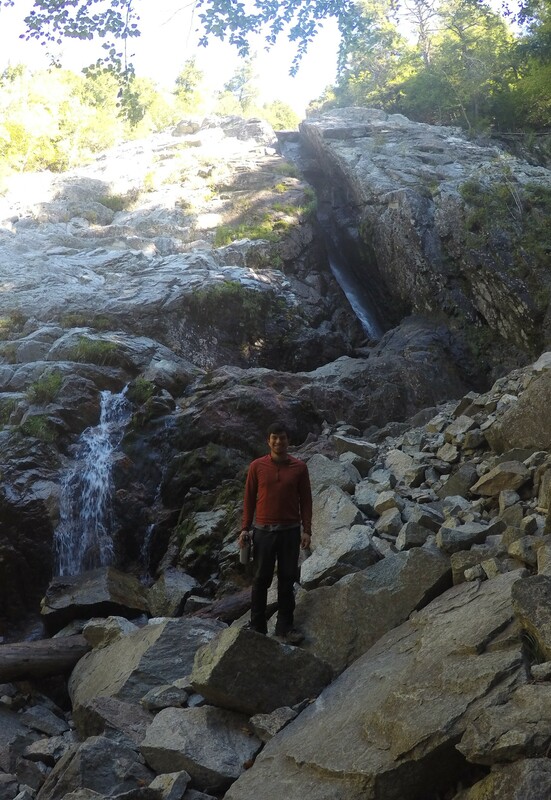 To reach this trail I first hike to Avalanche Lake and then on to Lake Colden. The mountains rise quickly on each side of Avalanche Lake and the trail is dotted with ladders, bridges and even cat walks built into several rock faces along the way. Lake Colden is much wider and I take the trail down the east side. I focus too much on the ladders and cat walks and miss the intersection of the trail to Mount Colden. After backtracking a bit I reach the summit just before noon. I enjoy the view for a few minutes and head back down after a quick lunch. I sign out at the Meadow Lane trail register at about 4:00 PM, ten hours and 15.2 miles after I began. Today I climbed Giant Mountain. At 4627 feet it is the twelfth highest of the forty-six high peaks. I take the Roaring Brook Trail approach which is 3.6 miles to the summit with an ascent of 3375 feet. It is just below freezing when I start and I wear the winter hiking clothes I bought yesterday. 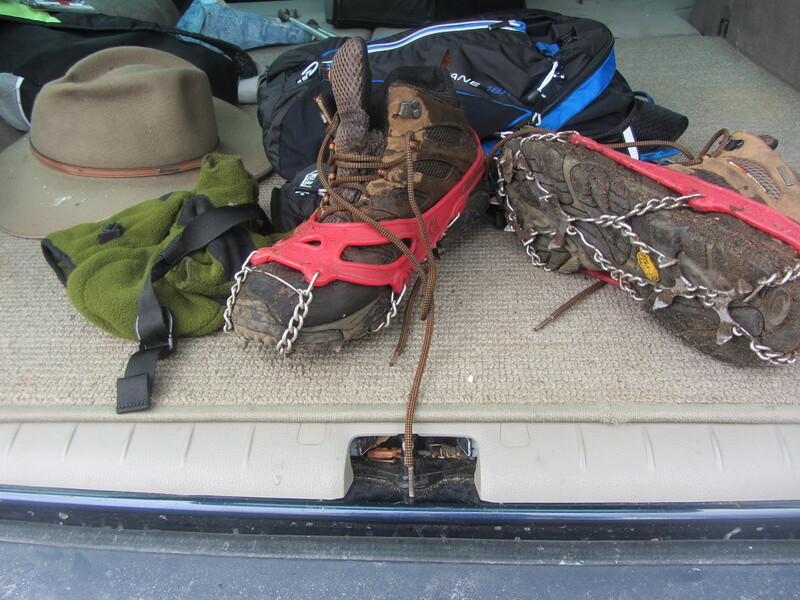 My hiking shoes are heavier today with spikes attached. The trees are bare and the lower part of the trail is covered with frosty dead leaves. The rocks that just weeks ago were coated with wet moss are now encased in ice that the spikes grip easily. 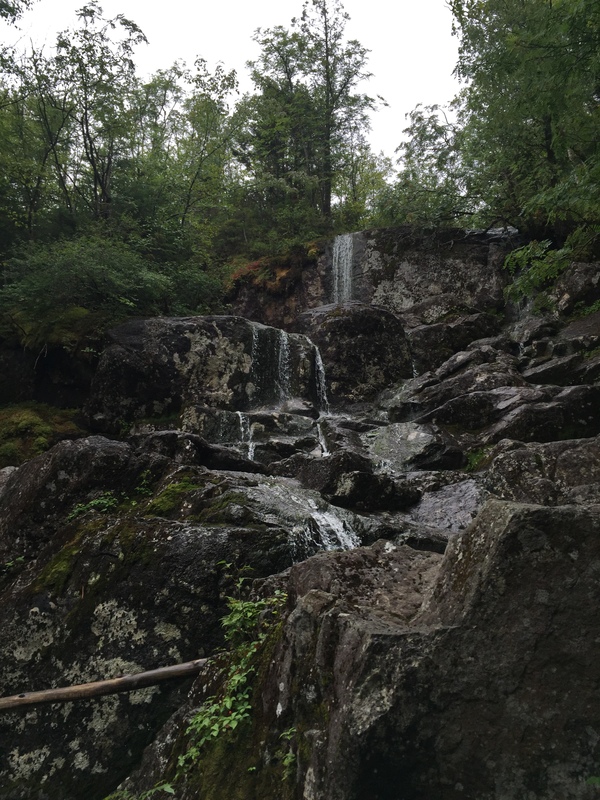 I make a quick detour to visit the Roaring Brook Falls before rejoining the trail to the summit. It starts to snow and soon the trail is covered with a light dusting that tells me that no one else has passed this way this morning. I pause occasionally to take pictures and make steady progress up the trail. I do not see another person until I am nearly to the top when I step aside to let a young couple come down a rock face from above. They are returning from having spent the night at the lean-to on the far side of the mountain with gear they rented for the weekend. They do not have spikes on their boots and it is too slippery for them to walk on this part of the trail. Instead, they sit and slide down the rock together, smiling and laughing the whole way down. I have the summit to myself. It is beautiful but cold so I do not stay long. On the way down I pause at the rock with the side by side slide marks and smile remembering how two people, clearly in love with each other, spent a few wonderful moments together in a wonderful place. There comes a time in life when you don’t look forward to birthdays. It’s like reading a good book. At the beginning you love everything you experience with each turning page and can never imagine that the story will end. As you reach the last pages you read each one with both excitement to see how the story will end and with regret realizing that this amazing story you have been reading is almost over and that once you have read the last page there will be no going back. Yesterday was my birthday and I decided that today would be the day I would hike to Mt. Marcy, the highest point in New York State. The mountain is named for New York Governor William L. Marcy, who authorized the survey that originally explored the area. Its first recorded ascent was on August 5, 1837, by a large party led by Ebenezer Emmons who were looking for the source of the East Fork of the Hudson River which they decided was Lake Tear of the Clouds, located just below Mt. Marcy. 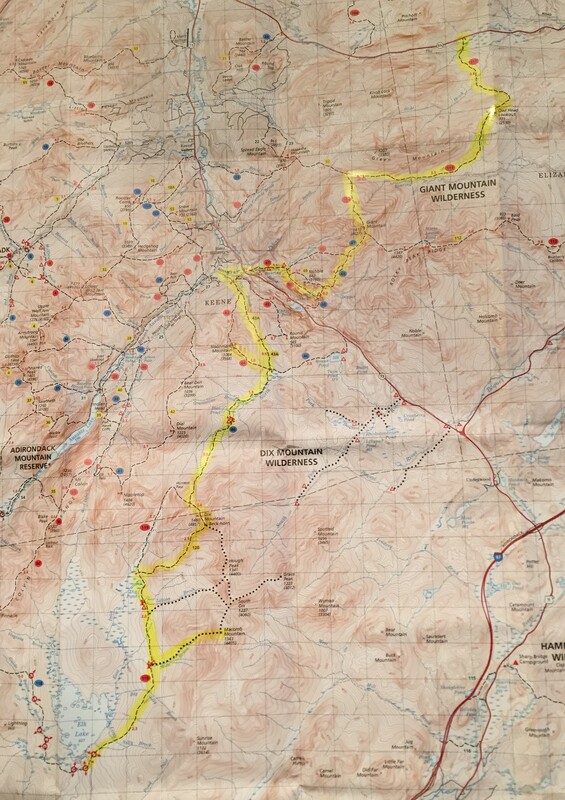 I start my hike at 6:30 AM and will spend the next eleven hours hiking seventeen miles. I spend most of the hike thinking about Saturday when I watched my nephew play in the homecoming football game. I met a friend from high school there and we drank coffee while sitting on the aluminum stands and telling each other about our respective daughters, each now much older than we were when we last spent as much time together as we did on Saturday. I remember fondly, but do not mention, the times we spent together floating down the Unadilla River in inner tubes and how she was the first person with whom I actually shared a kiss. Instead we talk about friends who have died and being in Explorer Scouts together and she laughs while telling me that her daughter loves to wear the tee-shirt that served as our uniform in 1977. When I say goodbye to her I realize that I had not seen her in over ten years and am a bit sad wondering how many more years will pass before I see her again. I summit Marcy at 10:11 AM and after a short stop continue down its other side to Lake Tear in the Clouds. The lake is clear and there are stones lining the bottom at the mouth where it empties into the stream that leads to the Hudson River. I have not seen a soul all morning and decide to go for a swim. I leave my clothes on a warm rock and wade out a ways. 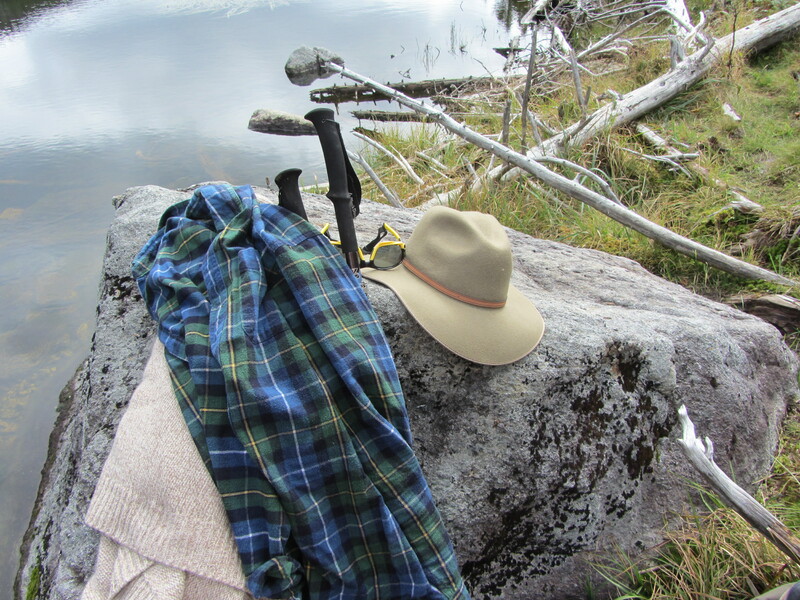 I consider swimming across the lake and back but the water is a bit too cold so after a few strokes I scamper back to the warmth of my flannel shirt and wool sweater. After the swim I climb Gray Peak, another of the 46, and then decide to head back to Marcy and leave nearby Mount Skylight for another hike. I have brought with me a molasses cookie and a single candle to celebrate my birthday. I ponder awhile, taking in the view of the valleys and mountain ranges below me. I think about all that I have accomplished since my last birthday and decide not to light the candle. While I don’t know how many more pages are left before my book will end, on this day and at this moment I can think of nothing better to wish for than to be exactly where I am, sitting on top of New York eating a molasses cookie with hair still a little wet. It’s 56° and there’s a light rain as I drive from Lake Placid into the Keene Valley to begin today’s hike to Porter and Cascade Mountains, two of the forty-six high peaks I hope to summit in the next four years. The conditions are not great but if I’m going to complete this journey in time for the 100th Anniversary of the founding of the 46ers I’m going to need to hike in all conditions. I have probably over-packed for today’s hike, a vestige from my Boy Scout days. I am carrying three liters of water in a Camelback, the pockets of which I have stuffed with a space blanket, emergency sleeping bag, signaling mirror, first aid kit, map, guidebook, flint and a survival knife. I am also carrying two sandwiches, some fruit and the compass pictured above. I start at 7:20 AM from the Marcy Field parking area and climb first to Blueberry Mountain and then on to Porter and Cascade before returning to the parking lot. I am alone today and will hike for thirteen miles, not seeing another person for eleven of those miles. The trail to Blueberry Mountain is very steep at the beginning but the mountaintop offers wonderful views of the fog lifting from the valley below. The trail is well-marked with yellow trail markers and stone cairns placed strategically across the rock outcroppings where there are no trees. 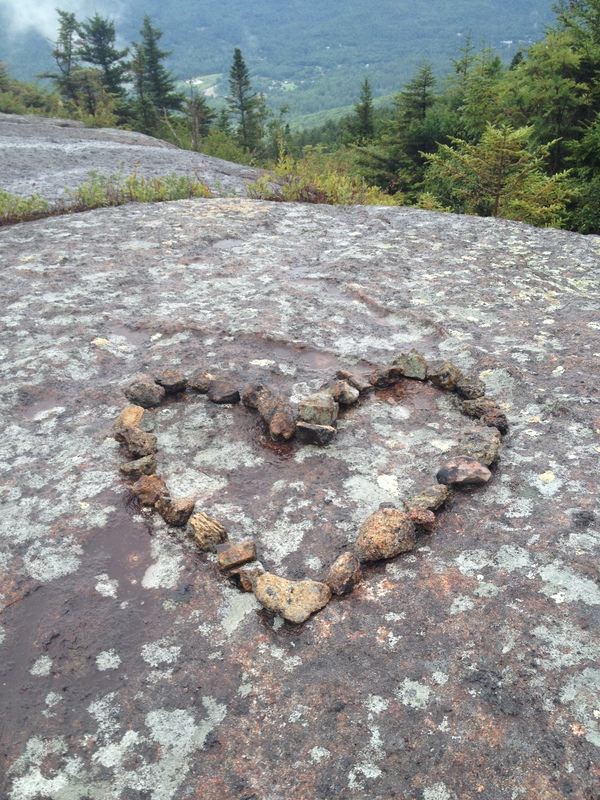 While following the line of cairns atop Blueberry Mountain I came upon some stones made into the shape of a heart. The moss growing on the stones tells me they have been here for sometime. As I head on to Porter I wonder about the story behind the heart on top of the mountain and begin thinking about a backpacking trip I took in the Adirondacks with John and Jerry in the late fall of our senior year of high school. At the time I had a terrible crush on a girl in our class. We’d become friends that summer and spent a wonderful day taking her younger sister on all the amusement rides at that year’s State Fair just before school began. I never mustered the courage to tell her how I felt about her and our relationship never went any further. Just before leaving for the trip I learned that she was going steady with the captain of the basketball team. I was heartbroken and not very good company to John and Jerry. With John, though, a bad mood never lasts long. While he had no great words of wisdom he just knew how to make you feel better and when we walked out from the woods three days later I was ready to move on from the heartbreak. Jerry died of cancer at age 41 and I remember how devastated his son JT was at the funeral. Later that spring John organized the first of many annual trips to South Carolina to take JT golfing and visit with Jerry’s parents. Over the years I watched JT grow into the amazing person he is today and marveled again at how John knew how to say and do just the right things to help JT deal with the tragic loss of his father. As I finish today’s hike I realize that I have never known a more dedicated and caring friend than John. So while I’ll never learn the true story behind the heart made out of stones I came upon in the Adirondacks today, I will choose to remember it as a symbol of the love shown by John to a friend who left us too soon. 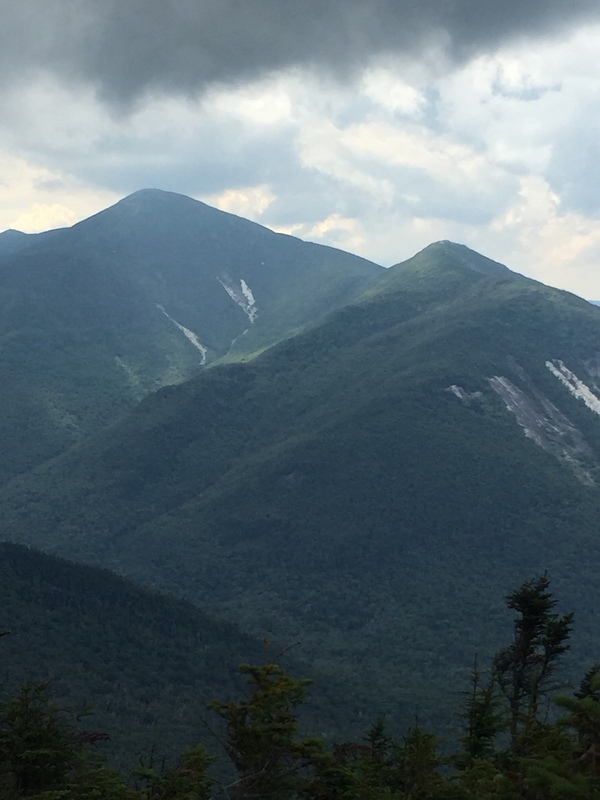 Next weekend I hope to climb two of the Adirondack’s forty-six high peaks, Porter Mountain (4059 feet, order of height 38) and Cascade Mountain (4098 feet, order of height 36). 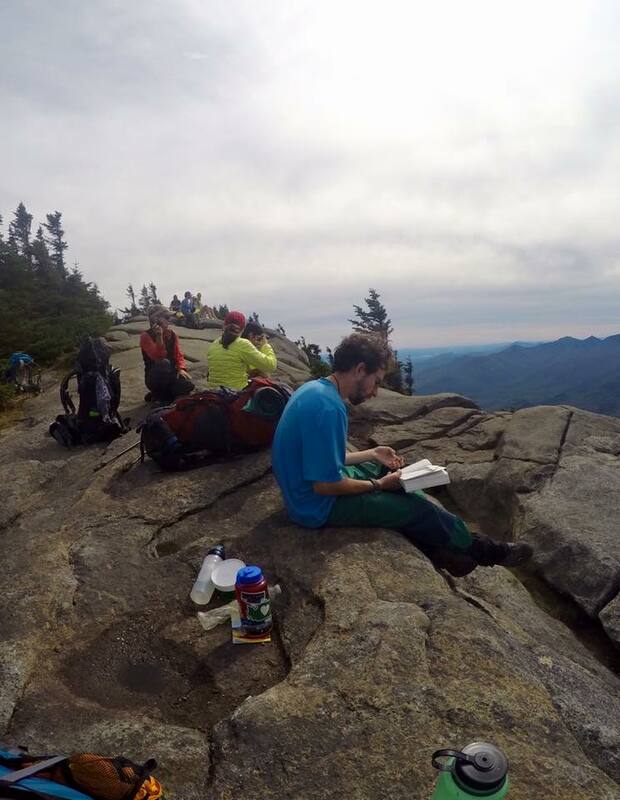 I’ll be guided on my journey to become a 46’r by the 14th edition of the Adirondack Mountain Club’s amazing book, High Peaks Trails, and the topographic map that accompanies the book and illustrates the trails to each of the high peaks. Porter Mountain is named for Noah Porter, Ph.D., the president of Yale University from 1871 to 1886. He was a summer resident of the Keene Valley and made the first recorded ascent of the peak in 1875 with renowned guide Ed Phelps. 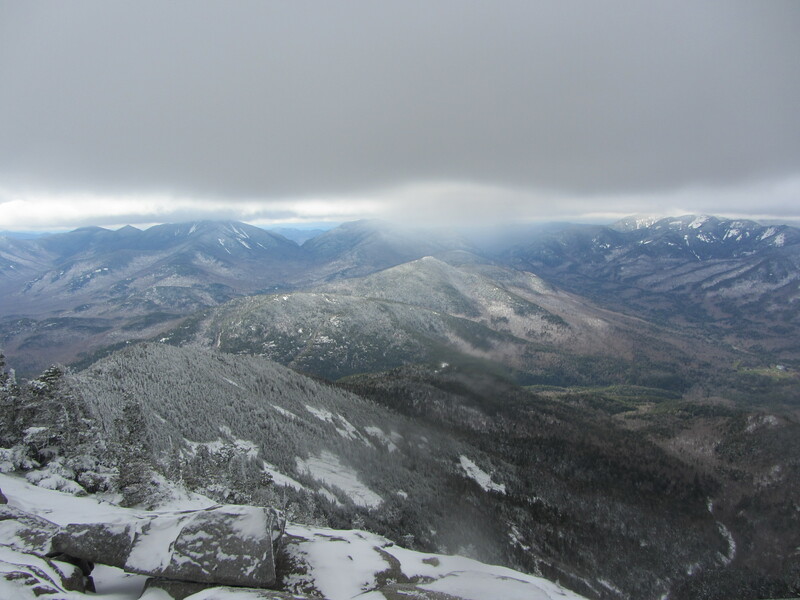 Cascade Mountain is one of the most popular high peaks hikes because it is easily accessible from a trailhead on Route 86, number 90 above, and has a bald summit that affords spectacular views of the area’s other high peaks as well as the Champlain Valley to the east. 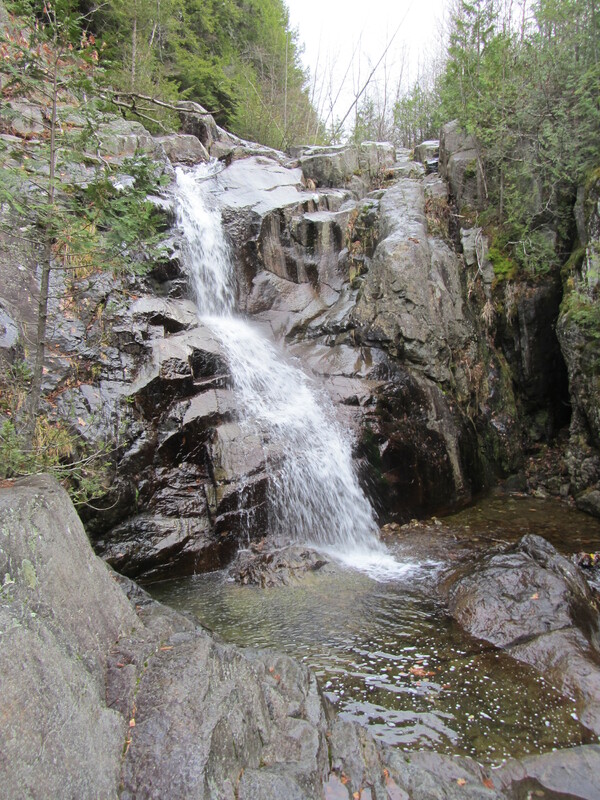 The mountain was originally called Long Pond Mountain but later renamed Cascade Mountain for the steep and beautiful waterfall that cascades down the mountain into the two lakes below. 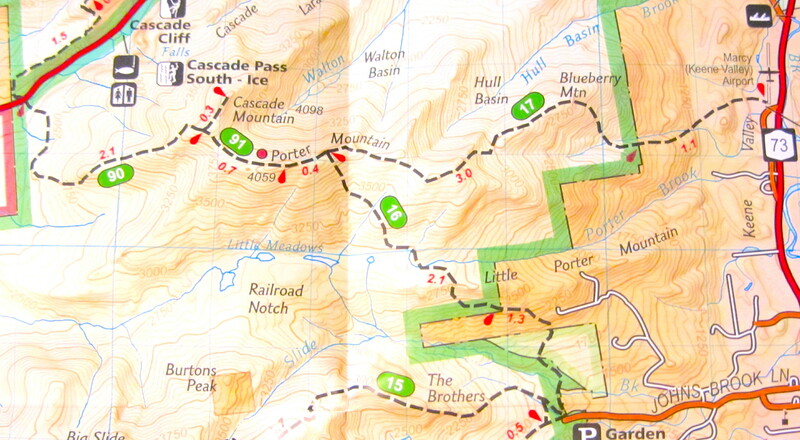 There are three trails to Porter and Cascade mountains. 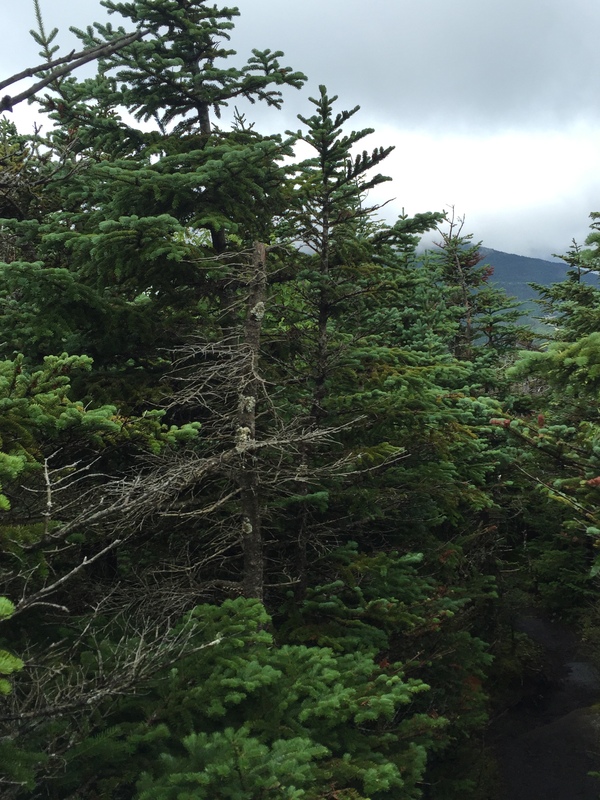 I have chosen the trail to Porter Mountain from Marcy Airfield by way of the Ridge Trail, number 17 above. High Peaks Trails notes that “there is some steep climbing in the lower sections, but the variety of views makes it worthwhile.” I’ll let you know whether I agree next week.